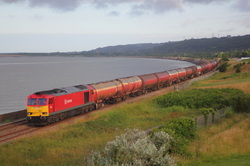 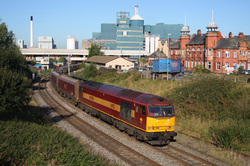 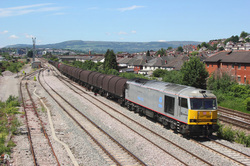 ​60062 "Stainless Pioneer" 7V33 empties to Westbury. 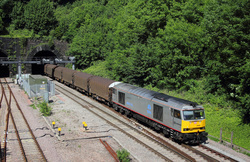 60062 "Stainless Pioneer" 7V33 empties to Westbury. 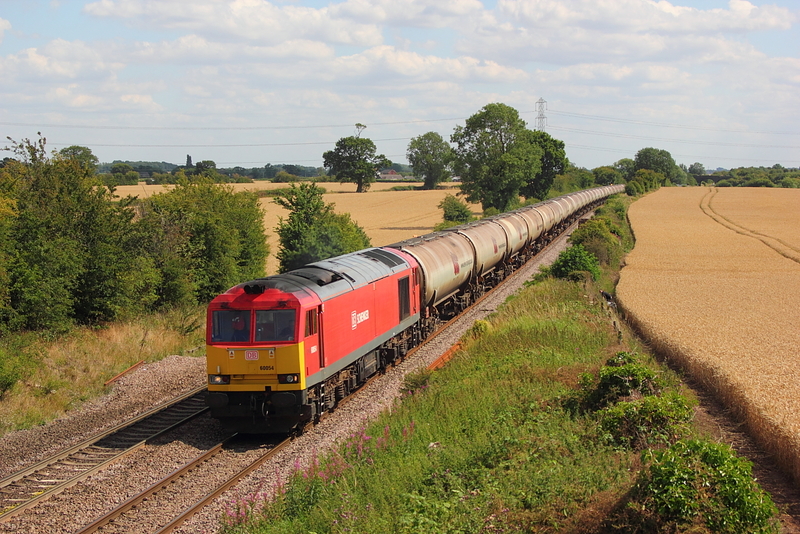 ​60007 6C48 Appleford to Whatley empties. 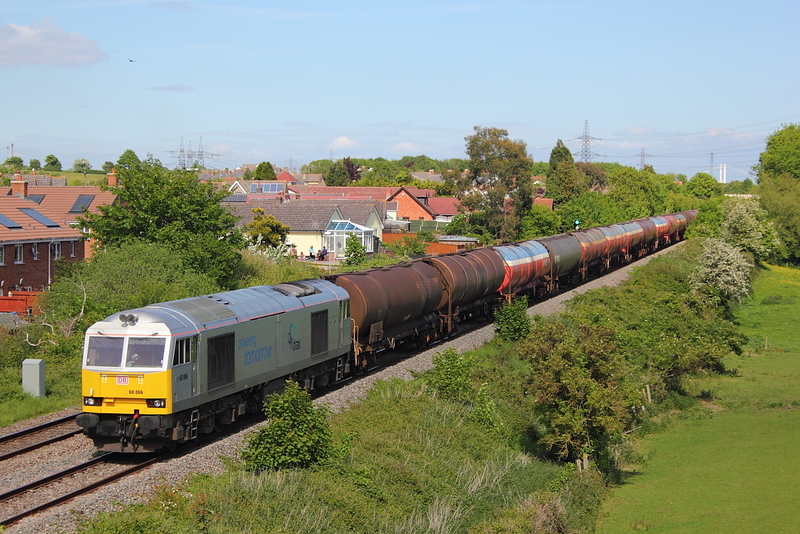 60002 6L44 Oxwellmains to West Thurrock cement. 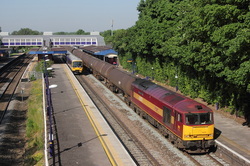 ​ 60001 6B13 Robeston to Westerleigh loaded tanks. 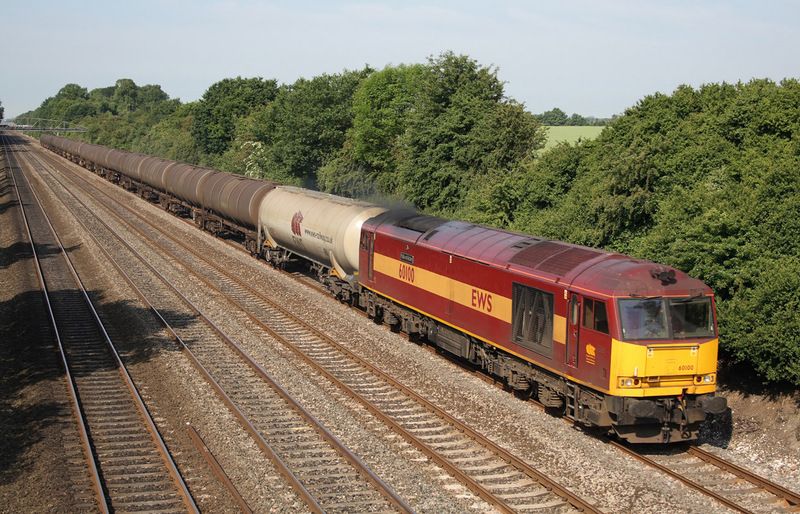 60056 6E38 Colnbrook to Lindsey empties. In a very lucky brief sunny slot ,60091 "Barry Needham" passes on a Margam to Llanwern loaded coils. 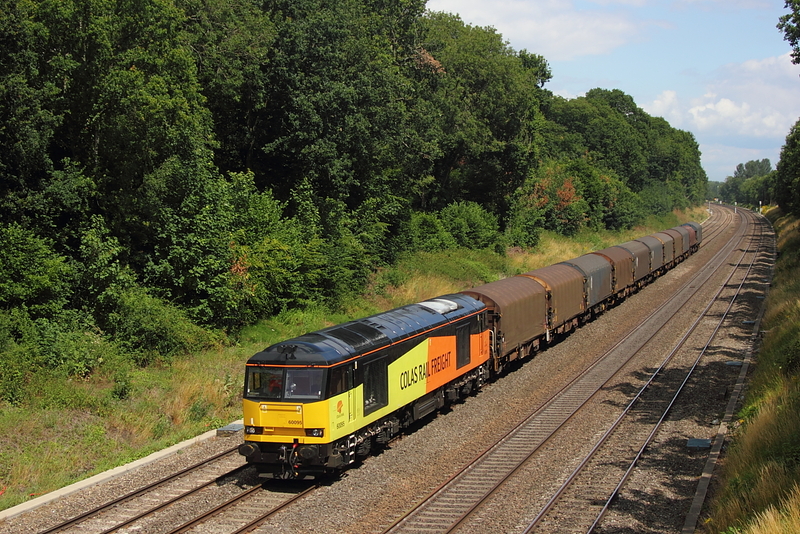 60091 "Barry Needham" 6F04 Llanwern to Margam steel empties. 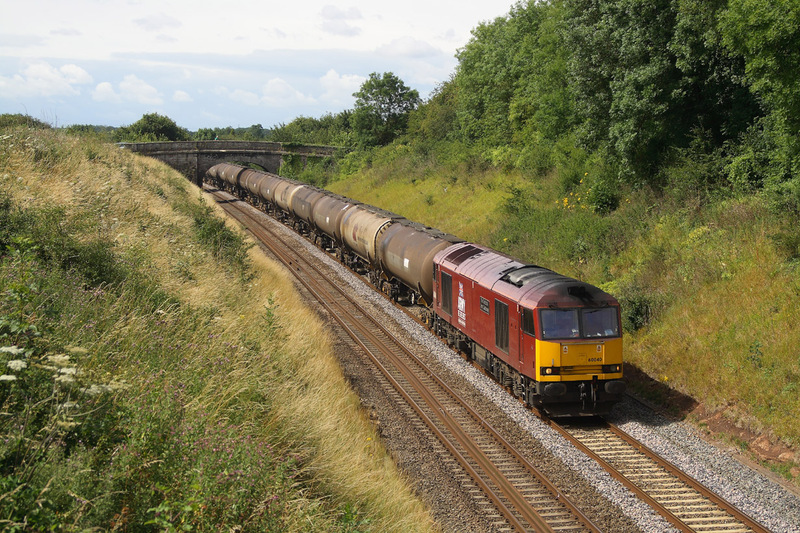 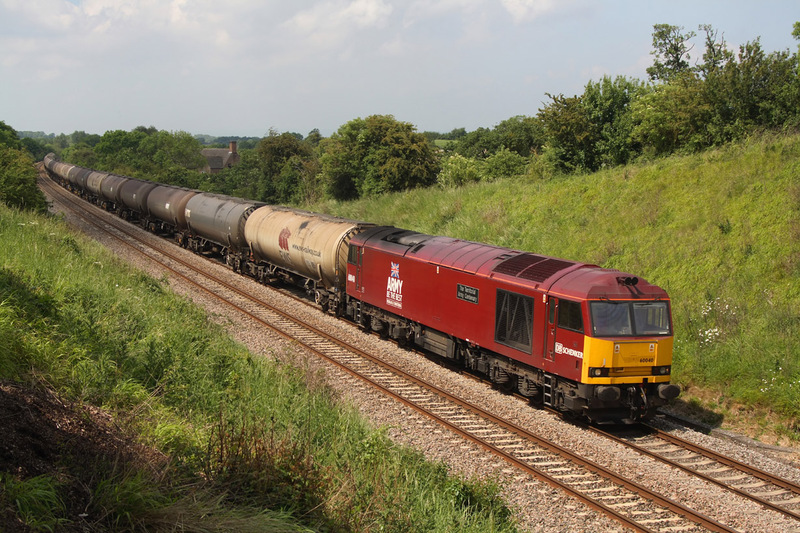 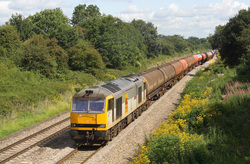 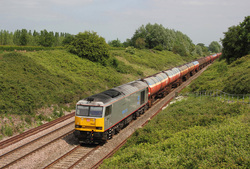 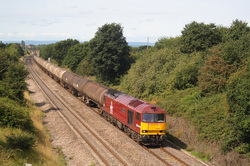 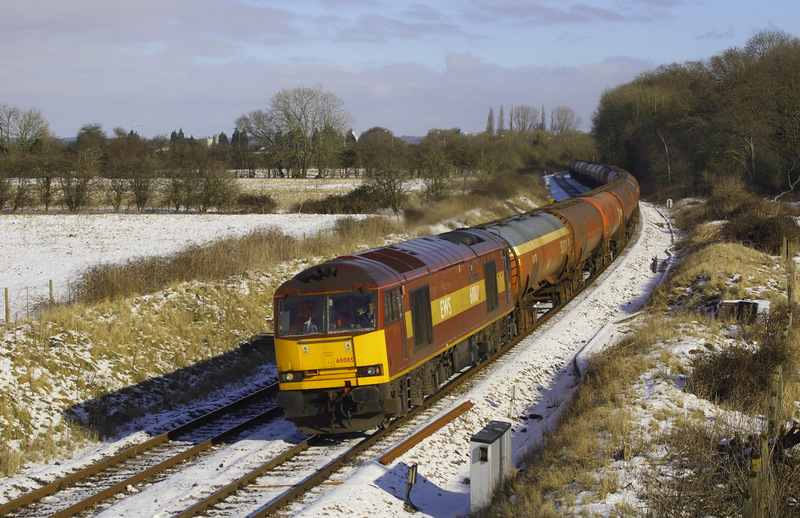 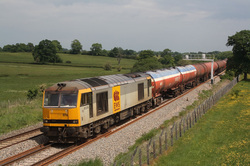 60100 6B13 Robeston to Westerleigh loaded Murco tanks. 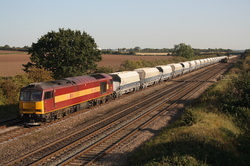 Silver Drax liveried 60066 passes with 6B13 Robeston to Westerleigh loaded Murco tanks . 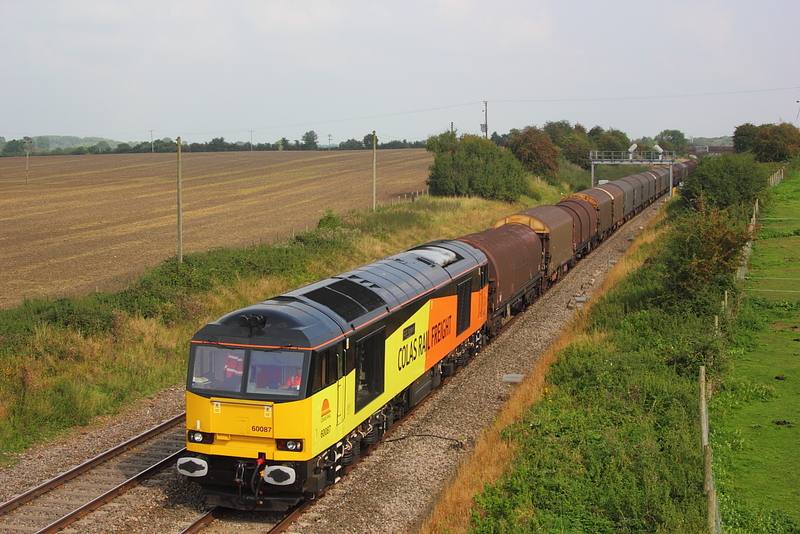 A quick dash from Melksham allowed a second stab of 60100"Pride of Acton" as it approaches clink road jnct. 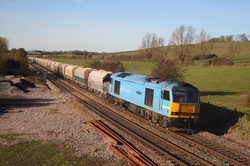 with 6C48 Appleford to Whatley empties,and proper sun this attempt. 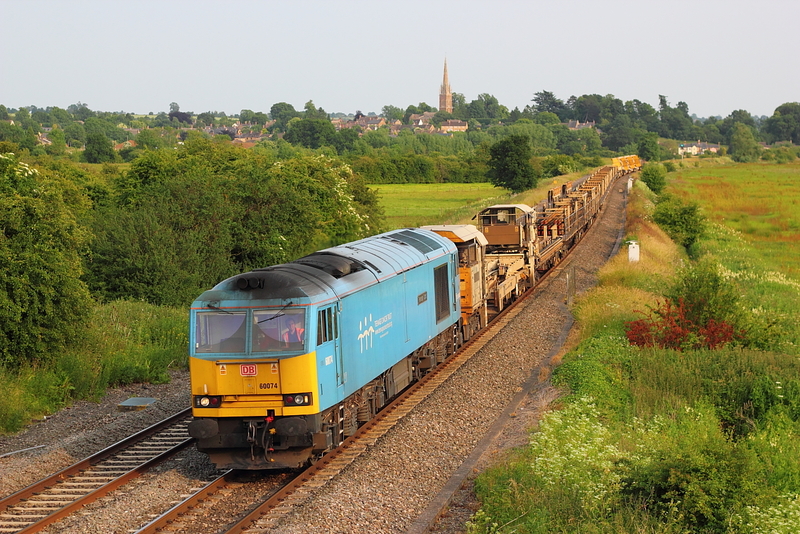 In a brief sunny-ish spell ,60100 "Pride of Acton" approaches Melksham with 6C48 Appleford to Whatley empties. On a later path 60091"Barry Needham" passes on 6A11 Robeston to Theale with loaded Murco tanks. Westbury super shunter 60007 "Spirit of Tom Kendell" is out to play for the second consecutive day working a loaded stone to Theale and seen here returning as 7C74 to Whatley and under a sunny sky. 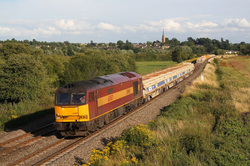 In late evening sunshine 60044"Dowlow" approaches the loop at Wallers Ash with 6X01 Scunthorpe to Eastleigh loaded rail. 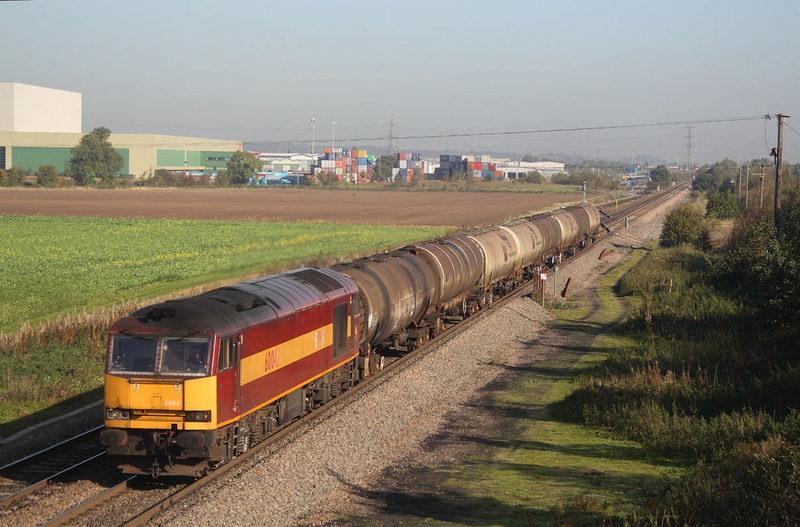 60019"Port of Grimsby and Immingham" passes a misty Baulking on 6B33 Theale to Robeston Murco empties. 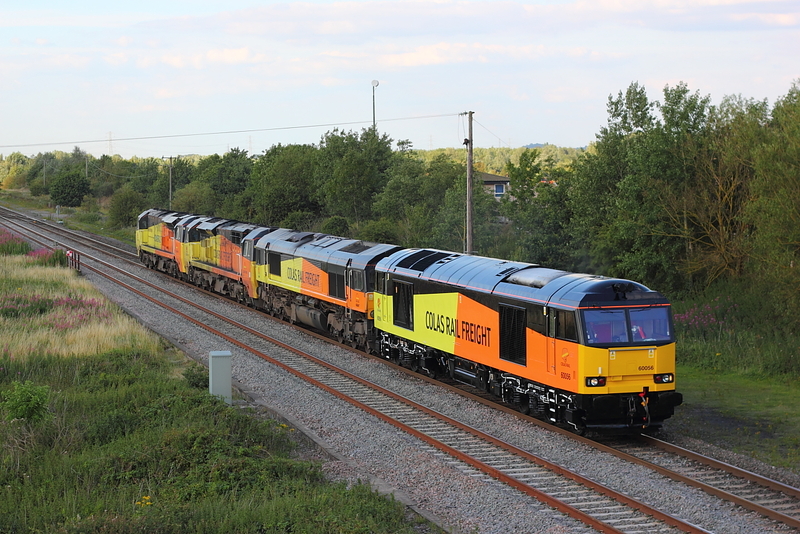 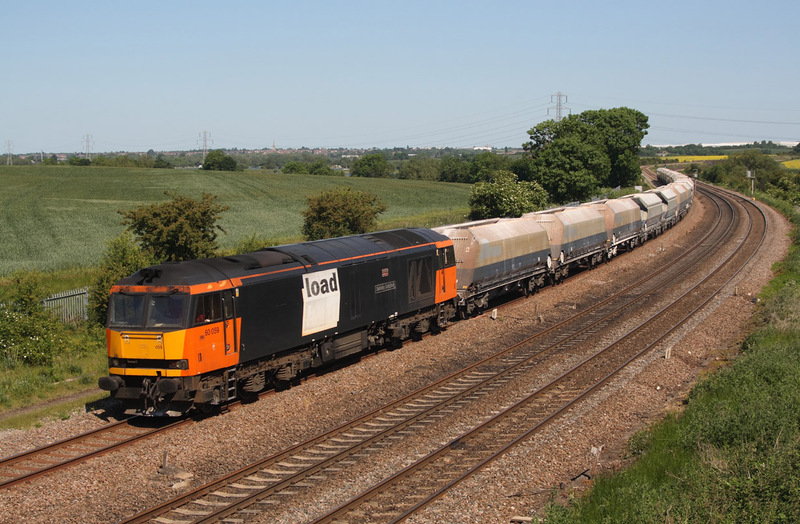 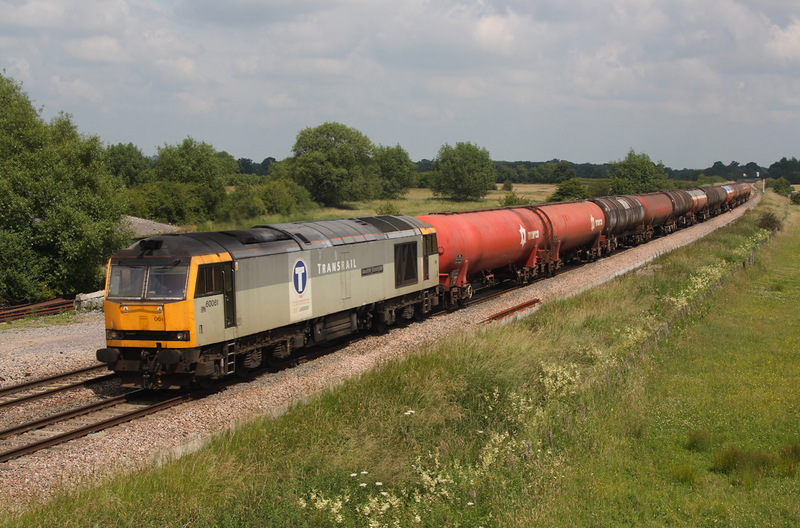 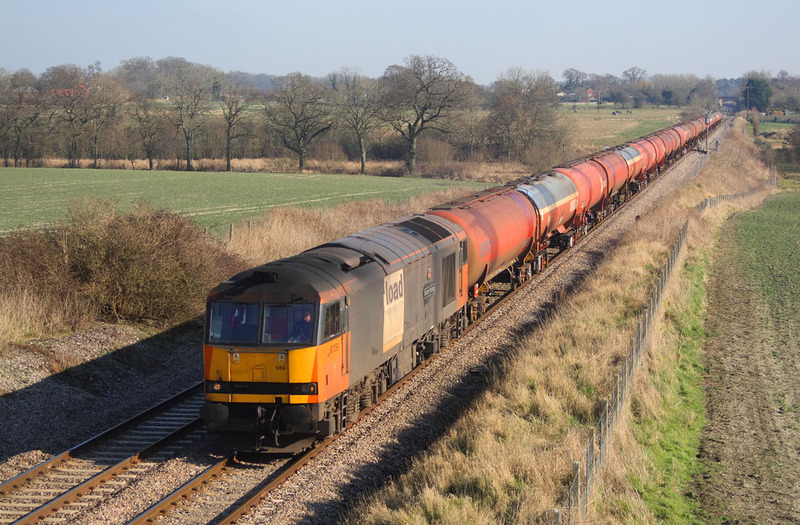 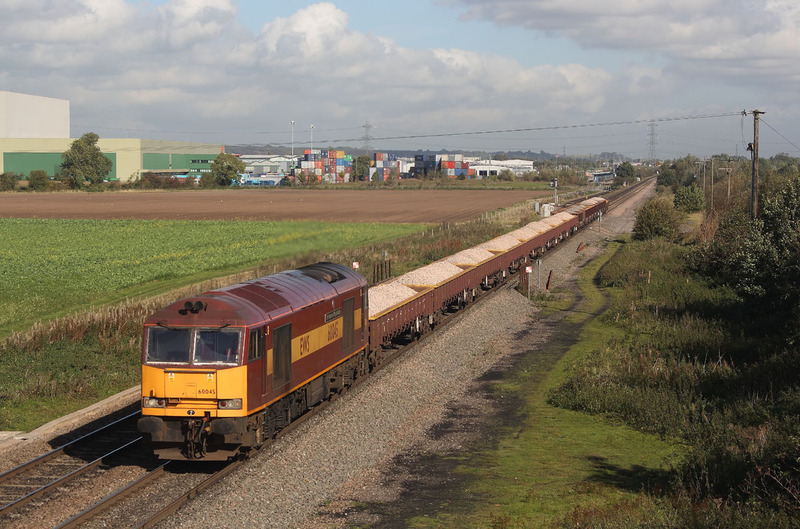 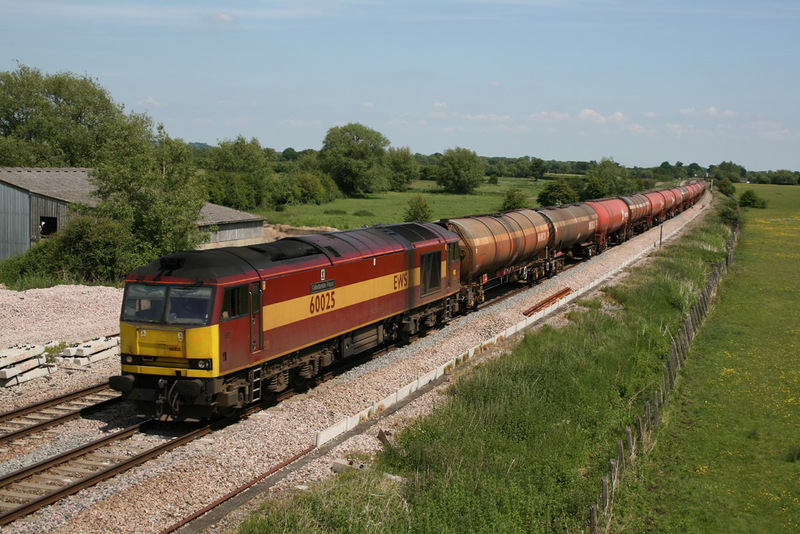 If the rumours regarding the demise of Shenker tugs become fact then this shot of 60019 on 6B33 Theale to Robeston Murco empties could well be my last. 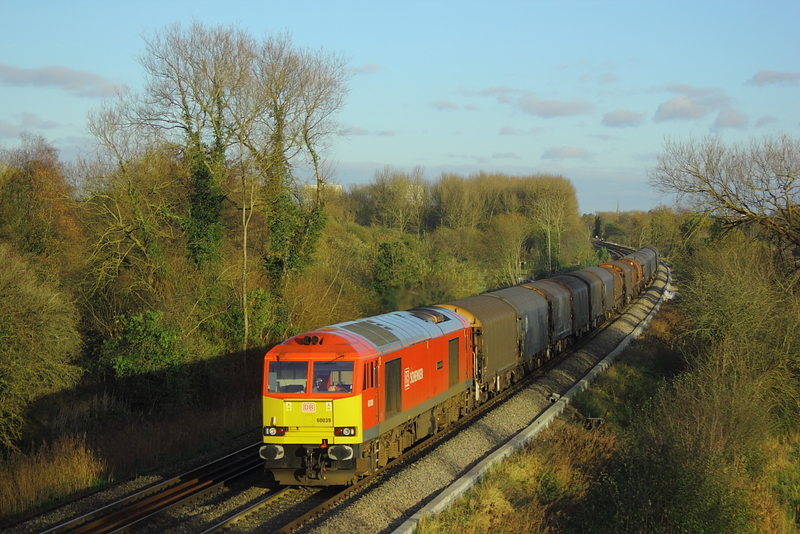 With 60019 just about keeping ahead of the cloud following behind it would prove to be one of three "skin of your teeth" situations during the day,but luckily all was well as 6B13 passed with the loaded Murco tanks from Robeston heading to Westerleigh. 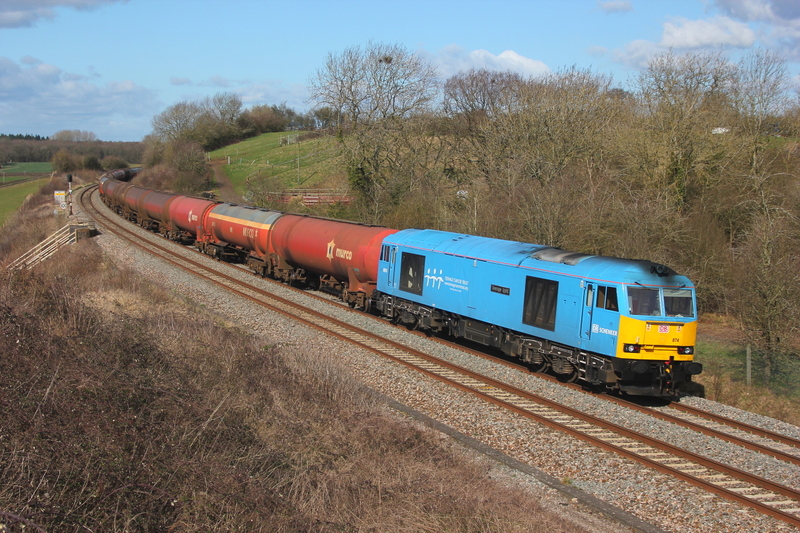 60054"Dove Holes" passes Padworth on the B&H route, on a diverted Saturday 6B33 Theale to Margam conveying empty Murco tanks from the nearby distribution depot. 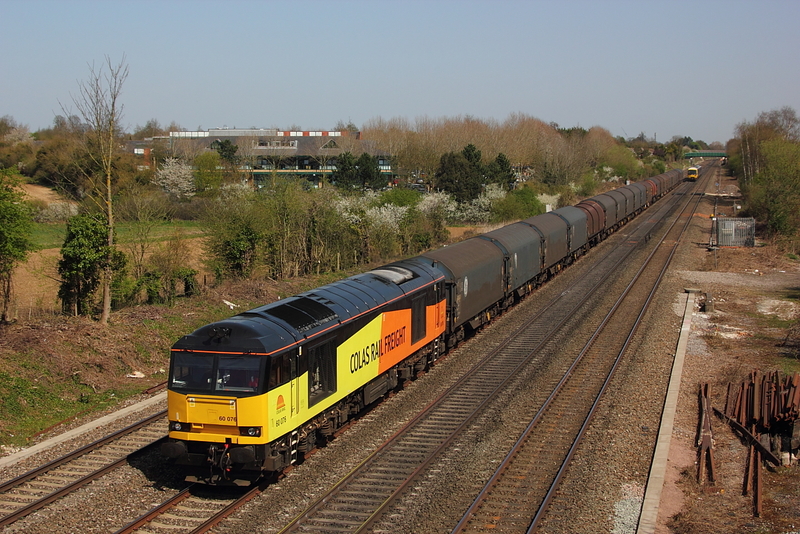 When DBS took over 6V62 ,the Tilbury to Llanwern steel empties utalising a class 66 my interest in this particular working wained ,however for a short while now one of their tugs seem to be favoured traction,how long for...who knows ,so its nice to get at least one shot in the bag just in case it doesn't last,and today 60001 did the honours. 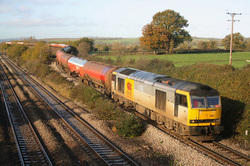 With the second engineers from Westbury Down T.C. suffering a wagon hot box and diverting into Exeter Riverside,a bit of a wait was antissipated,and due to the sun angle getting considerably worse at Langstone Rock,a move was undertaken,and consequently once commited to the move sods law kicked in and the bloody thing had already departed Riverside....hence this better than we thought location at Starcross station ,as 60096 passes with 6C25 to Par. 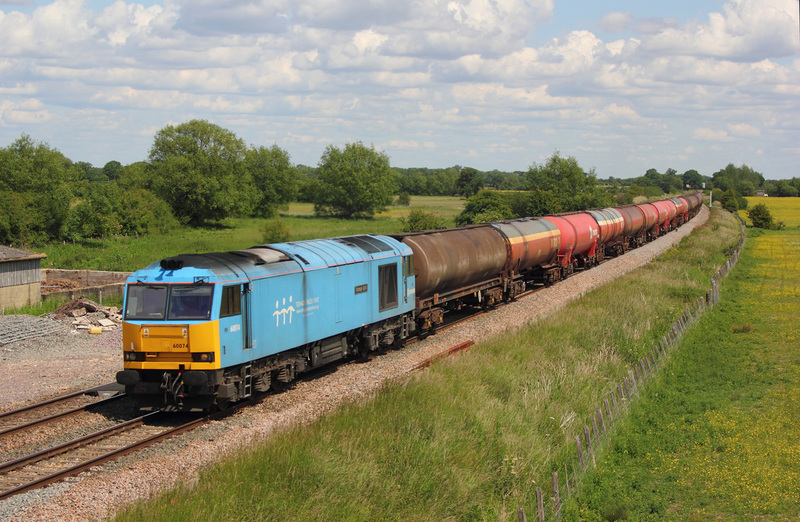 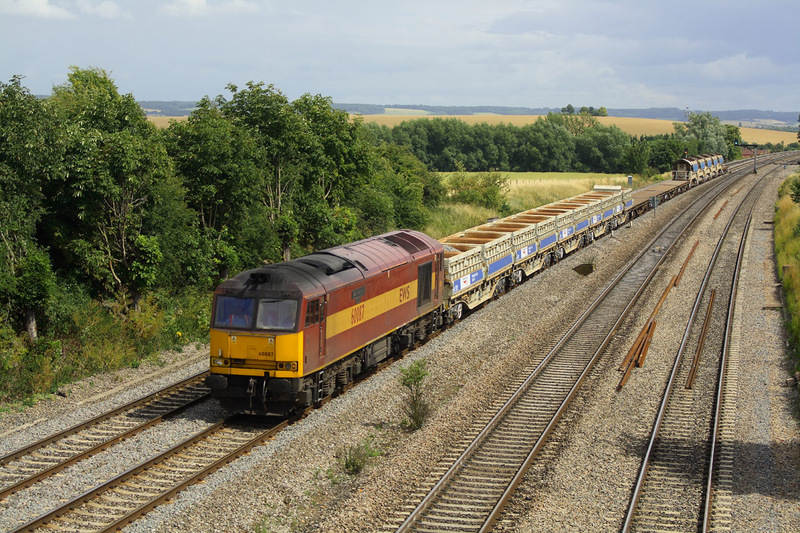 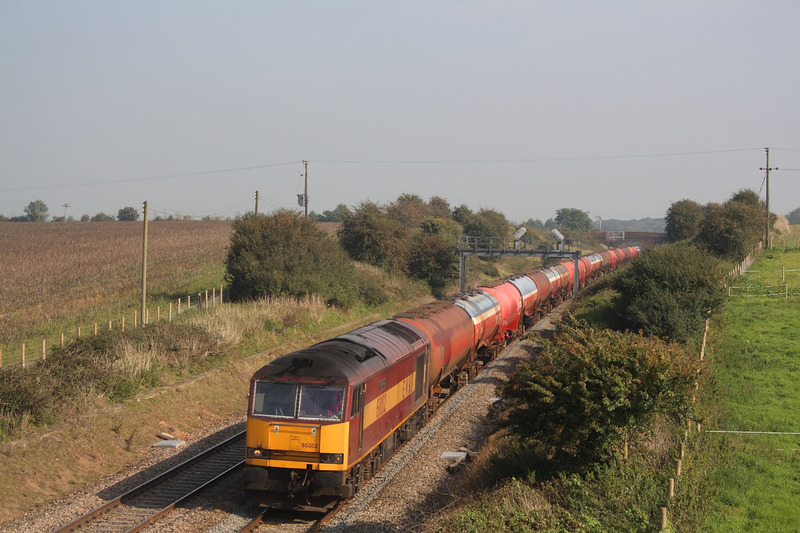 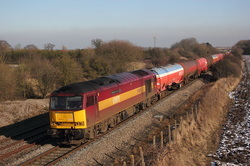 60054 6E41 Westerleigh to Lindsey empties. 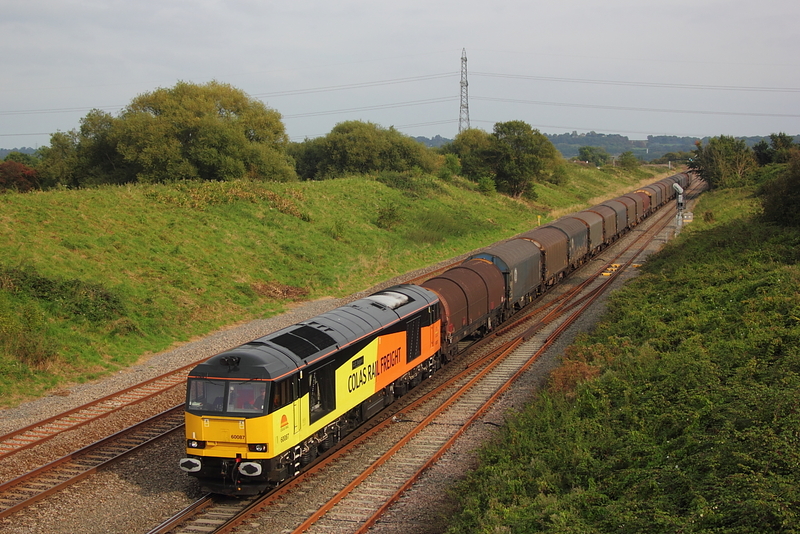 Shining like a new pin,Colas 60095 passes with the Saturday 6V62 Tilbury to Llanwern steel empties,and another skin of the teeth shot,as no sooner than the shot was taken the sun went behind a everpresent cloud. 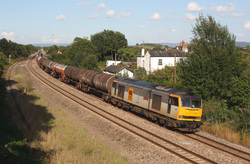 Sometimes you just have to make best with what you got,as here at Portskewett,with the sun angle far from best,however having spent most of the day biking around Gloucester ,forest of Dean area,a phot of a retimed 6B47 Westerleigh to Robeston empty Murco tank train was always on the cards,and having already seen that the sun angle was poor earlier a move west was undertaken,and as it turned out into cloud ,so by the time I returned to Portskewett the cloud was already catching up and 60066 passes in the last seconds of sun. 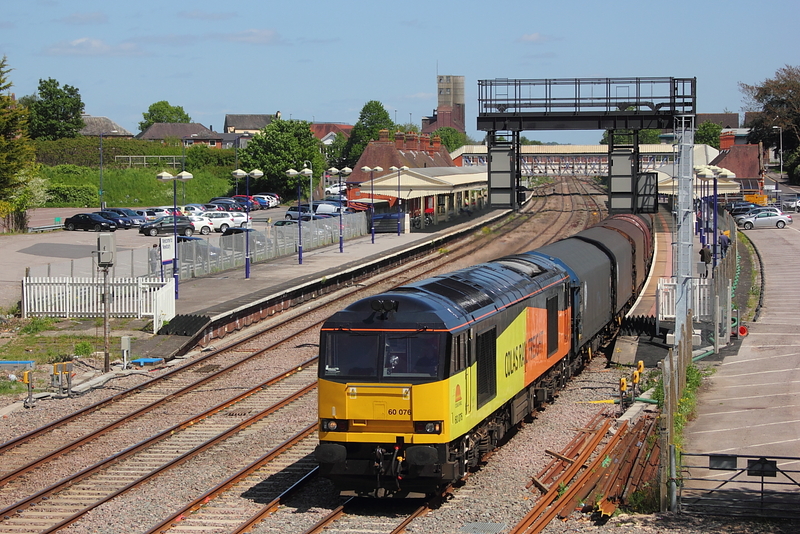 With 60076 taking its booked stop at Theale loop a quick dash to Newbury allowed a second stab of 6V62 Tilbury to Llanwern as it passed through the platform line at Newbury station. 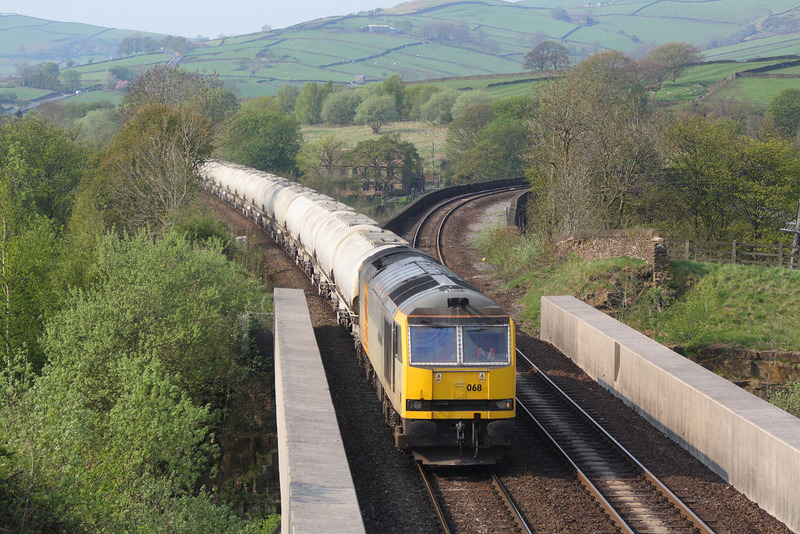 One good thing to come out of the forthcoming electrification,is the preparation beforehand,where bridge rebuilds or replacement usually comes with a clear out of trees ,bushes etc,and this is the case ,at Padworth ,allowing a far wider shot of 60063 on 6B33 Theale to Margam empty Murco tanks,as it passes. Due to the running time off the Saturday diverted Theale to Margam empty Murco tanks anywhere on the B&H is hard to find with a good sun angle,and having already done the Crofton area,which is probably best suited to this working,i actually said SOD IT and concentrated on other things.Always intending to end up at this location for a later 6V62 ,it was a bonus to find out that 6b33 was running late and when it finally passed in the hands off 60091"Barry Needham" it was 138Minutes late making a far better shot than would have been achieved if it ran on time. 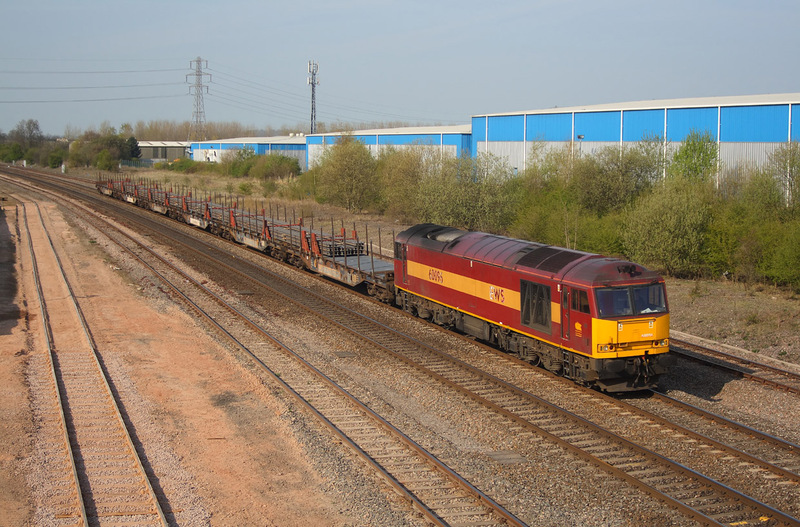 60076 6V62 Tilbury to Llanwern empty steel. 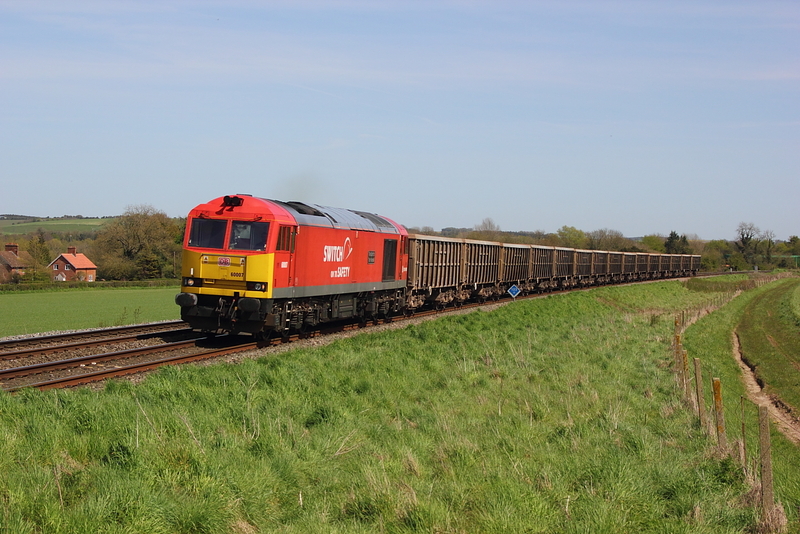 En route to Baulking for another shot of 6V62,i noticed 60076 approaching the end of the loop at Challow ,very slowly enabling this shot of the Tilbury to Llanwern empty steel. 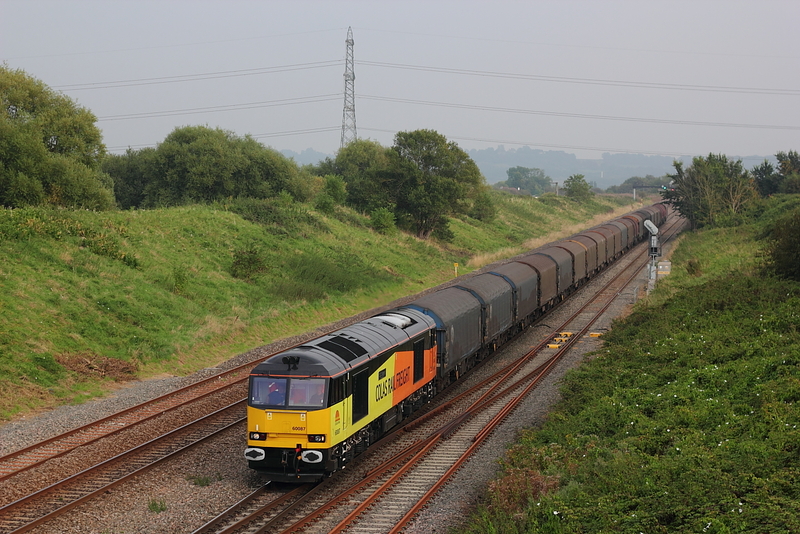 Running unusually on a Friday,is 6V62 Tilbury to Llanwern steel empties with Colas 60085 at the helm. 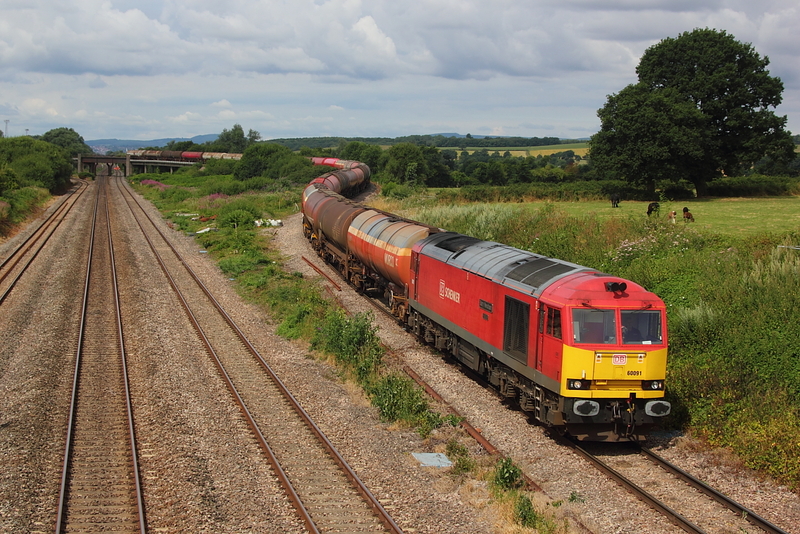 Celebrity silver Drax tug,60066 passes Bourton on a Friday 6B33 Theale to Robeston Murco empties. 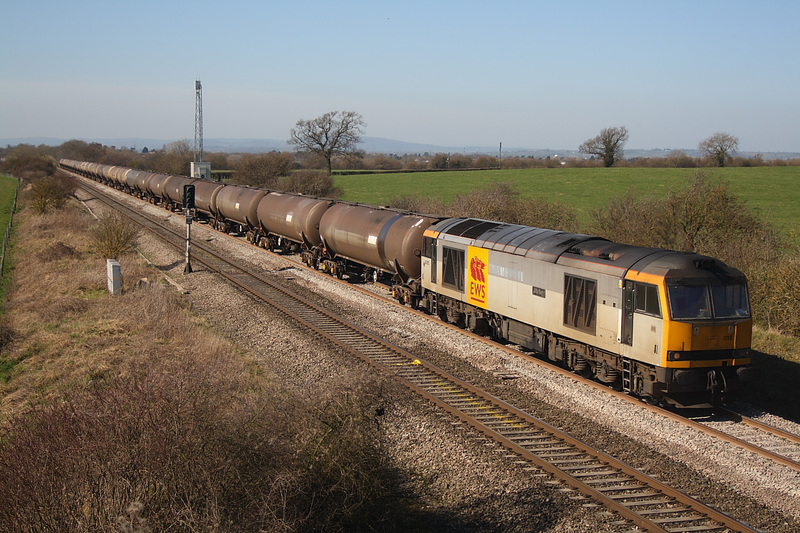 Practice Makes Perfect....not in this case,unlike the previous practice shot off a HST,i managed to chop of the rear tanks of the diverted 6B33 ,Theale to Margam empty Murco tanks as it passed by the locks at Croften ,hauled by 60054,and even the geese buggered off. 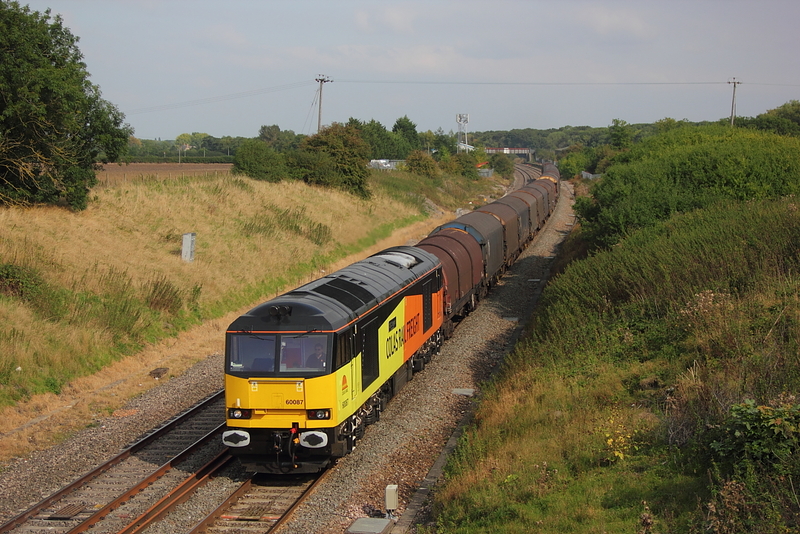 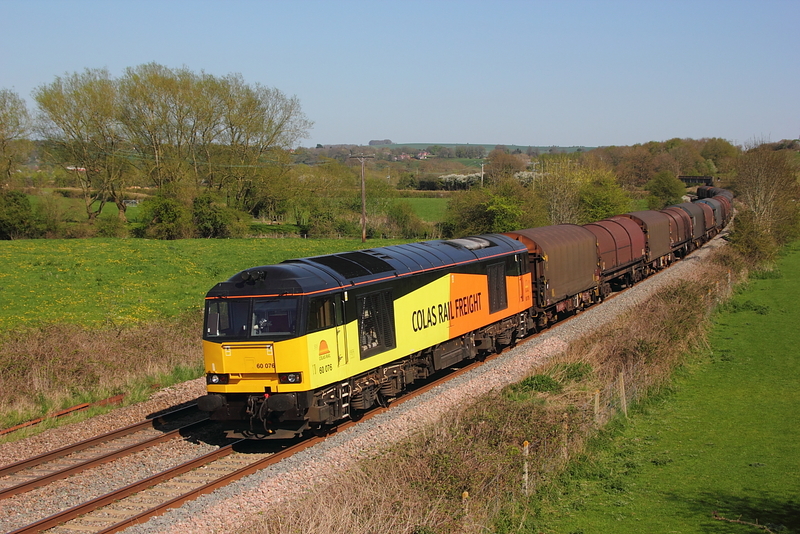 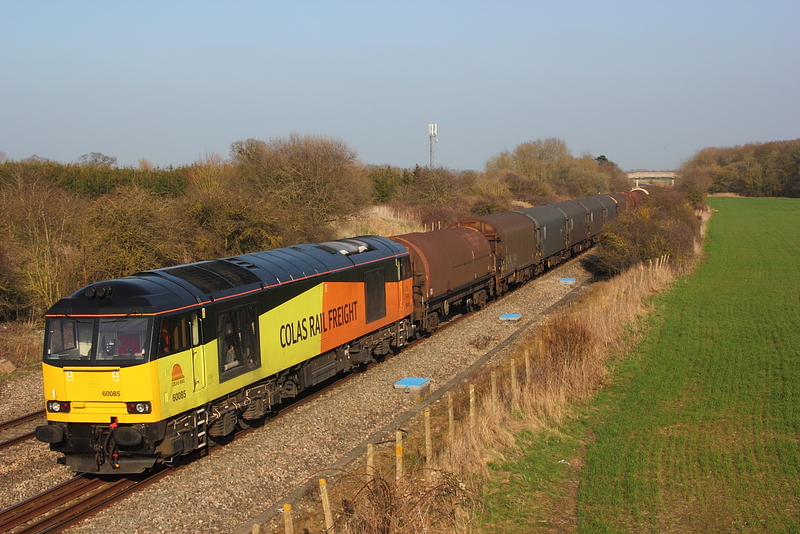 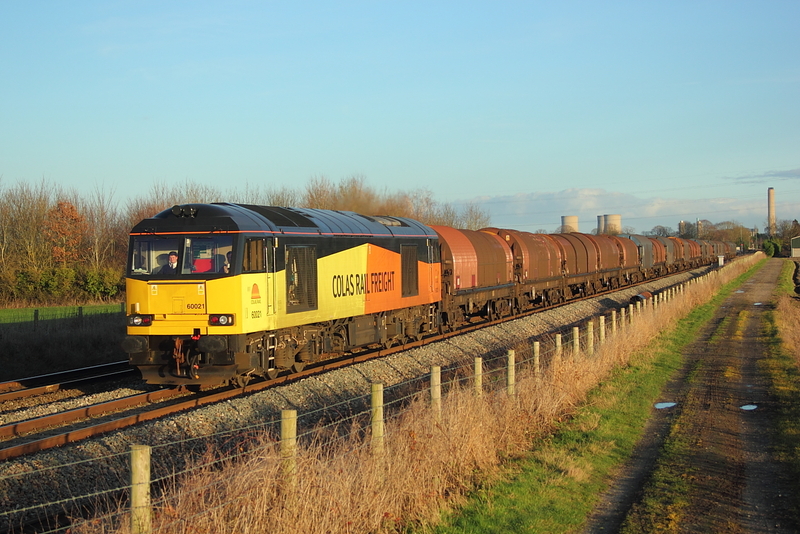 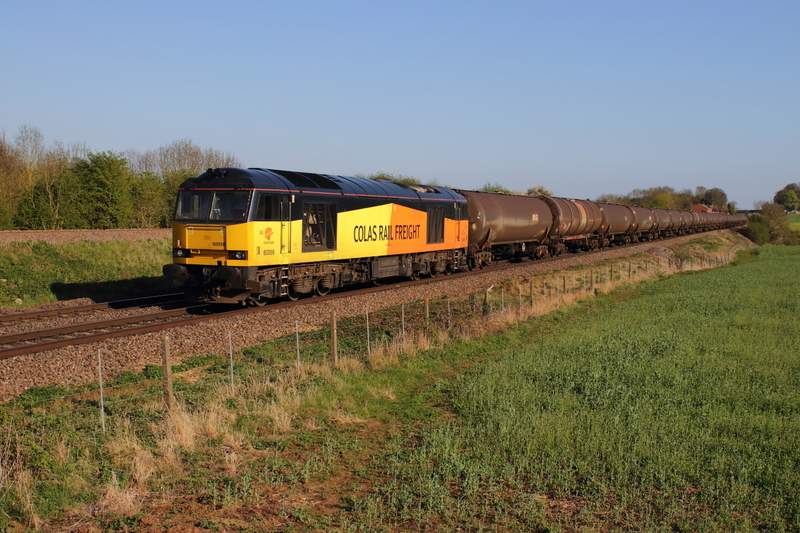 Colas 60021 on 6V62 Tilbury to Llanwern steel empties. 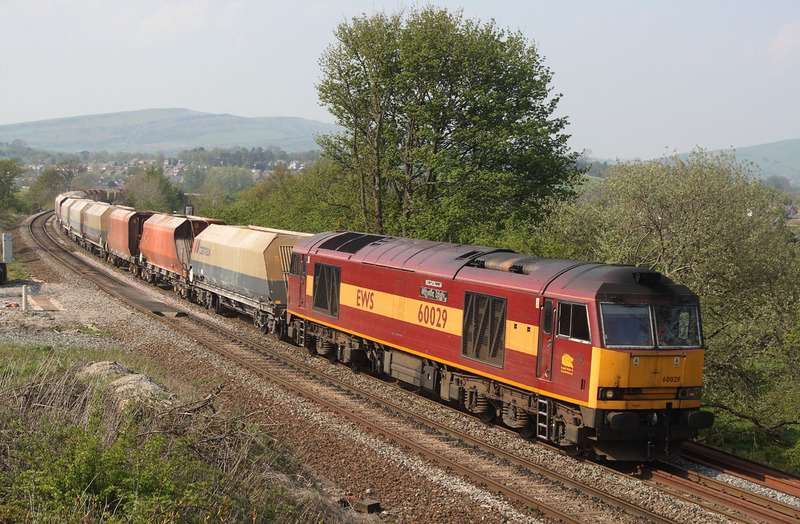 60024"Clitheroe Castle" 6B33 Theale to Margam Murco empties. 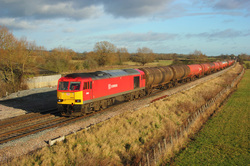 Original planned location for the Tilbury to Llanwern empties,was Chipping Sodbury,however due to the limited sunny spells so far in the day a shot at Bourton proved to be the right move for once as travelling back down the M4 the sky was pretty dire in terms of any brightness ,well until Pilning ,when a second sunny shot of 60087"CLIC Sargent" on 6V62 was achieved. you all know the score.......standing around with the sun burning the back of ones neck for ages, UNTIL the subject matter comes within sight that is....as today with 60087"CLIC Sargent" on 6V62 Tilbury to Llanwern empties passing by coinciding with a short period of muck in the sky then walk back (in my case to the bike,today) in full sun,but a vast improvement on what I have been getting on this sodding working this year. 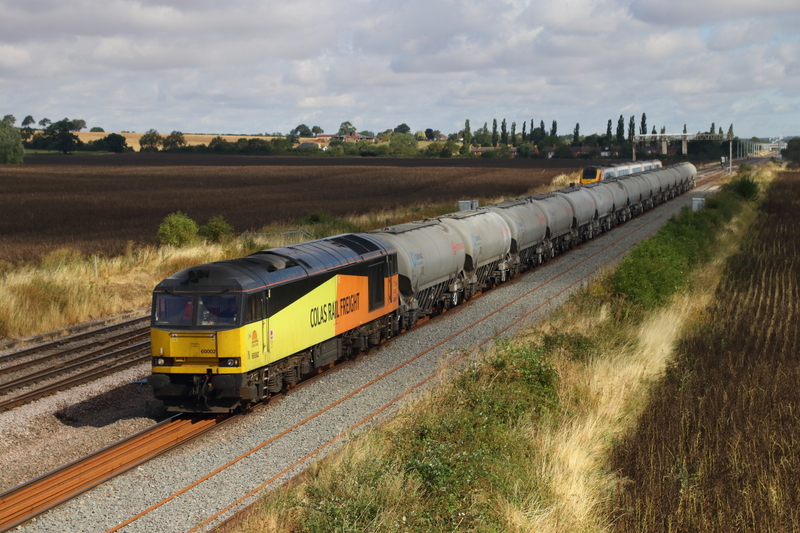 on its first outing on the Tilbury steel,60086"CLIC Sargeant" 6V62 Tilbury to Llanwern ,unfortunately the loco failed further West with a air pipe problem. 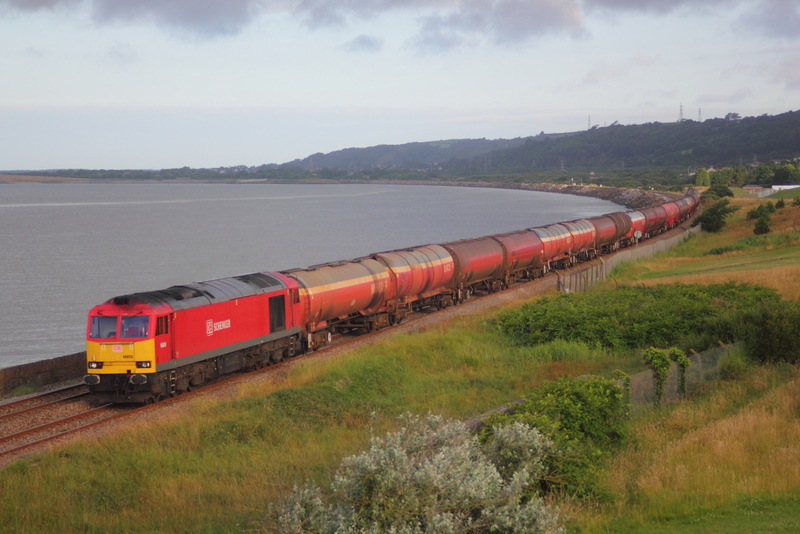 Staying in West Wales,a sunny start to the day was hoped for to bag 6B13 ,Robeston to Westerleigh,passing alongside the coast at Pwll,but alas no such luck,and best I could get was 60020 with the loaded Murco tanks,with the cloud building early enough to thwart my plan. 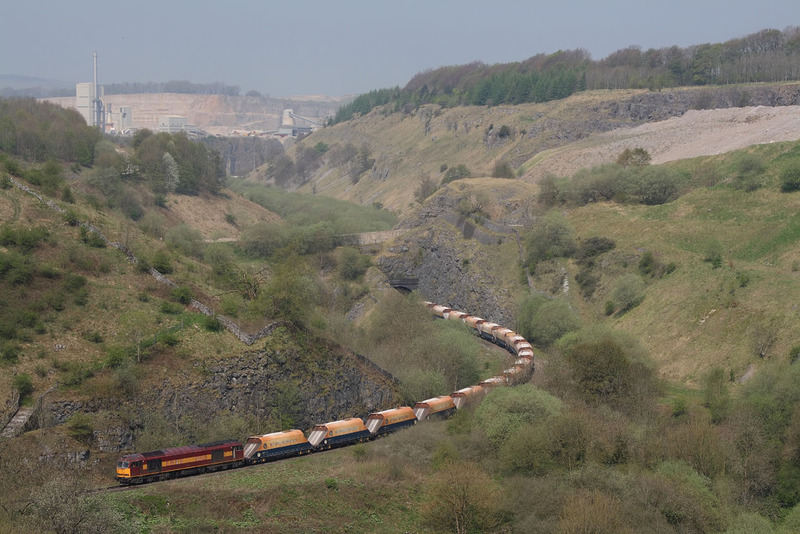 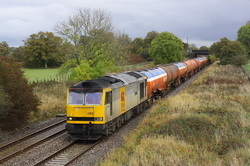 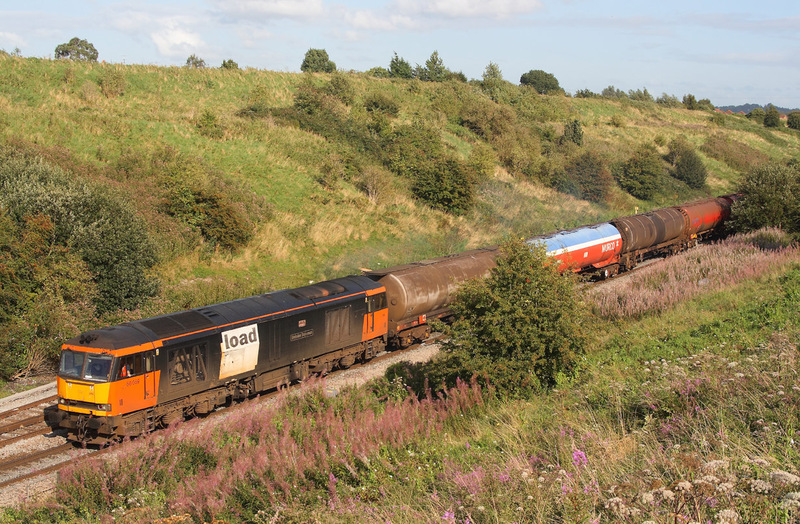 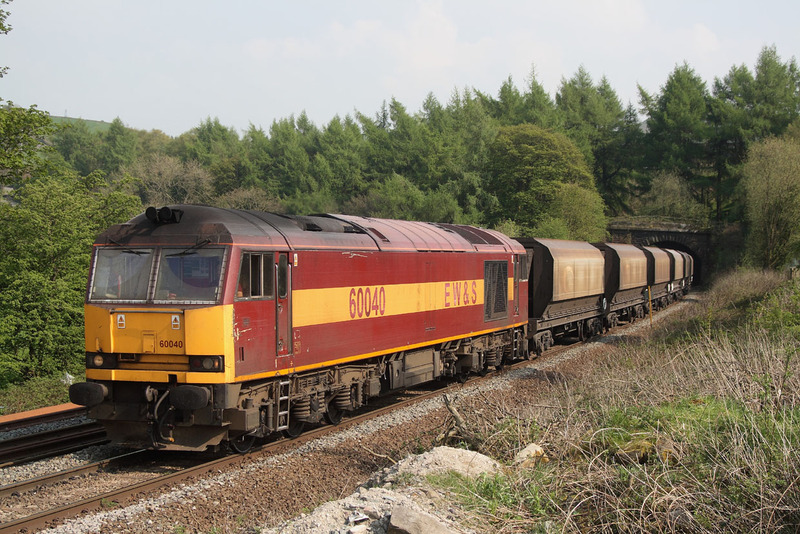 The trip was intended for a Colas grid on 6V62,so to get 60020 on 6B33 Theale to Margam empty Murco tanks was a bonus has I arrived a few minutes before it arrived,however the shot turned out to be a lifesaver really,as the sodding grid was 4Hours late leaving the capital,so would have probably been in the dark if I stayed. With engineering work at Reading affecting the Saturday Theale to Margam empty Murco tanks,6B33 was rerouted via the B&H route instead of its normal Swindon direction,hence with no HSTs to worry about an early departure was on the cards,and in this case ...just as well,running 30 minutes early ,60040"The Territorial Army Centenary" passes alongside the Kennet and Avon canal between Crofton and Great Bedwyn,just before the arrival of a huge bank of cloud ,which would have ****** things up somewhat if the tanks had been on time.Now awaiting payback time for this bit of good luck. Making a first appearance for some time,the Sundays 6A70 Didcot Yard (stabled overnight Saturday in Didcot yard ,Ex Lindsey) to Colnbrook loaded tanks ,passes Ruscome with 60020 doing the honours. With a few minutes to spare a second stab at Shrivenham of 60074"Teenage Spirit" on 6B33 Theale to Robeston Murco empties was acheived.Try as i might in the past i have not been able to get this Locomotive (in this livery) at this roadbridge and the Denchworth location due to cloud cover,usually at the precise incorrect time,if you know what i mean,but rectified today. 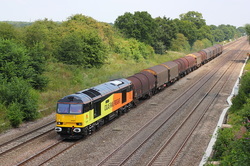 Supposedley the start of our long awaited summer,did produce a cracking start to the day,enough for me to venture out to Sonning for a shot of 60059"Swinden Dalesman" working 6V70 Didcot yard (having arived from Lindsey overnight) to Colnbrook, loaded tanks. 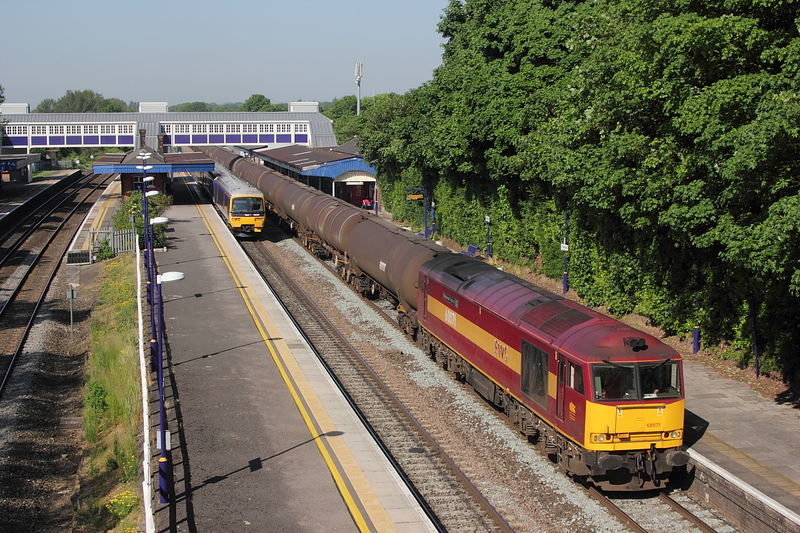 After a layover from Lindsey at Didcot yard,on the Saturday night,60071"Ribblehead Viaduct" continues on the Sunday morning 6V70 fuel tanks to Colnbrook and seen here passing through Twyford station. 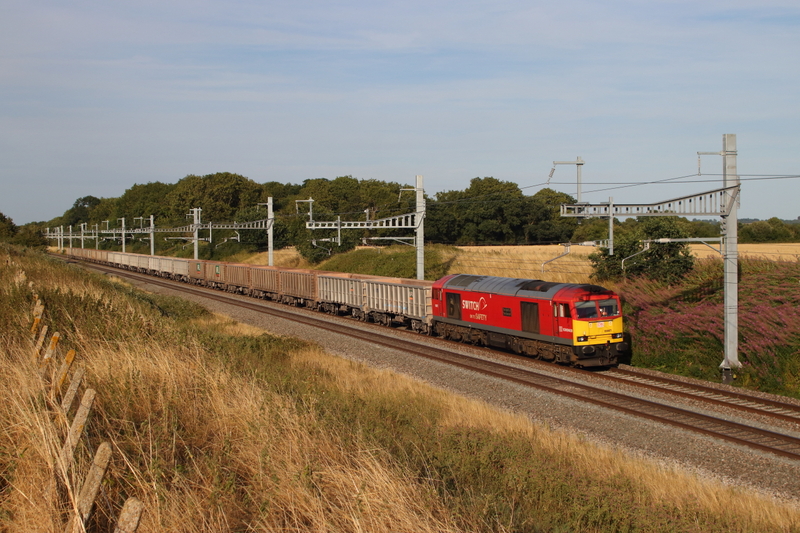 Sods law would dictate that the only two freights would probably cross,and they did.....With the camera at the ready to phot 60054 on 6B33 Theale to Robeston Murco empties,then a rumble could be heard behind as 66562 passes the other way with the Wentloog to Southampton liner. 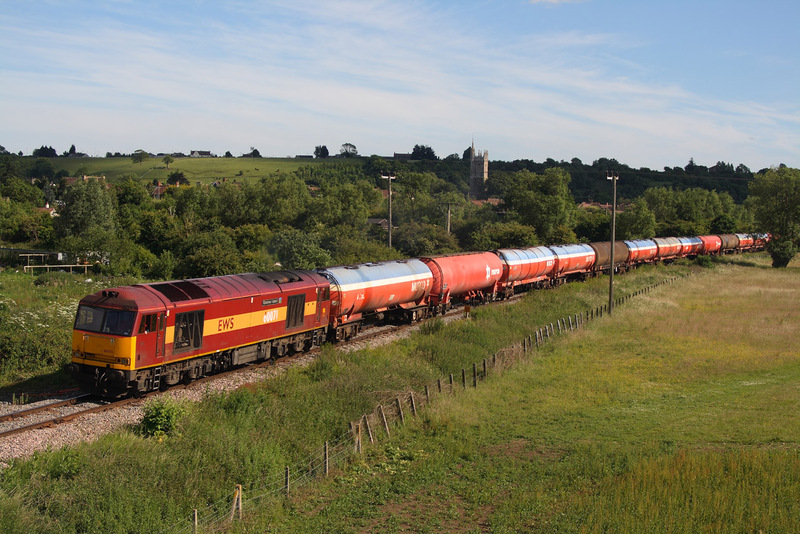 Recentley repainted back into its "Teenage Spirit" livery,60074 passes on the retimed MO 06.06 , 6B13 Robeston to Westerleigh loaded Murco tanks. 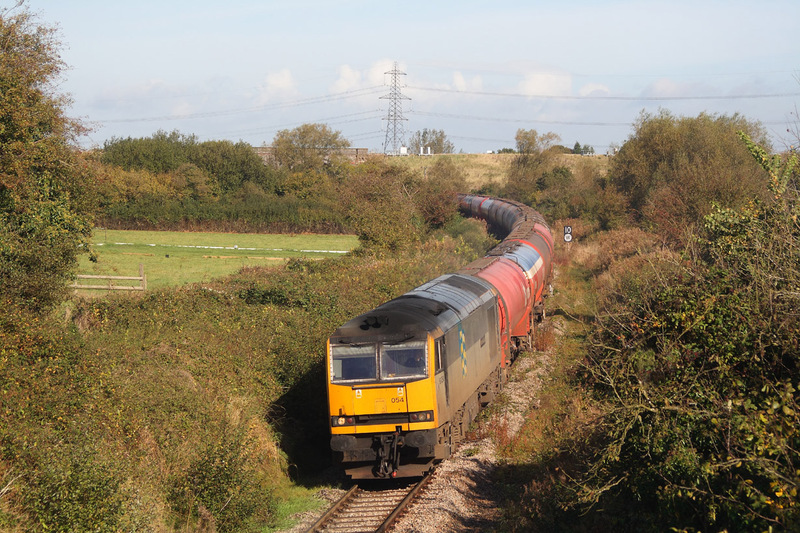 Seeing that this loco has been avoiding me on the tanks,and even though its in a filthy condition i decided to attempt to beat it from Challow loop to the road bridge at Shrivenham,which was successful and hence 60071 "Ribblehead Viaduct" powers past on 6B33 Theale to Robeston empty Murco tanks. 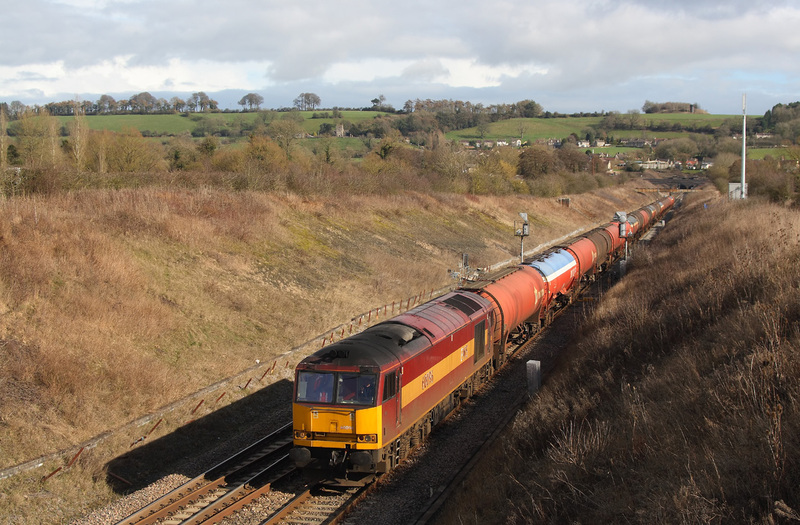 60071"Ribblehead Viaduct" 6B33 Theale to Robeston Murco empties,glad to see it back on a regular Saturday turn. 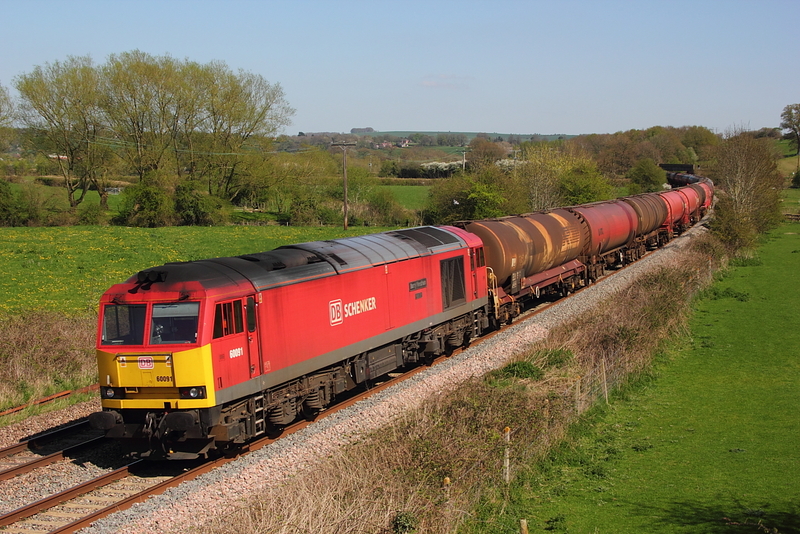 Another tug too secumb to the corporate DBS livery is 60091,seen passing with clean end leading on the now Saturday Q , 6B33 Theale to Robeston Murco empty tanks. 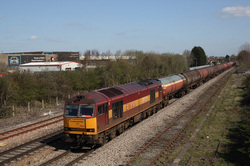 60054..6B33 Theale to Robeston empty Murco tanks. 60007"The Spirit of Tom Kendell"6B33 Theale to Robeston Murco empties. 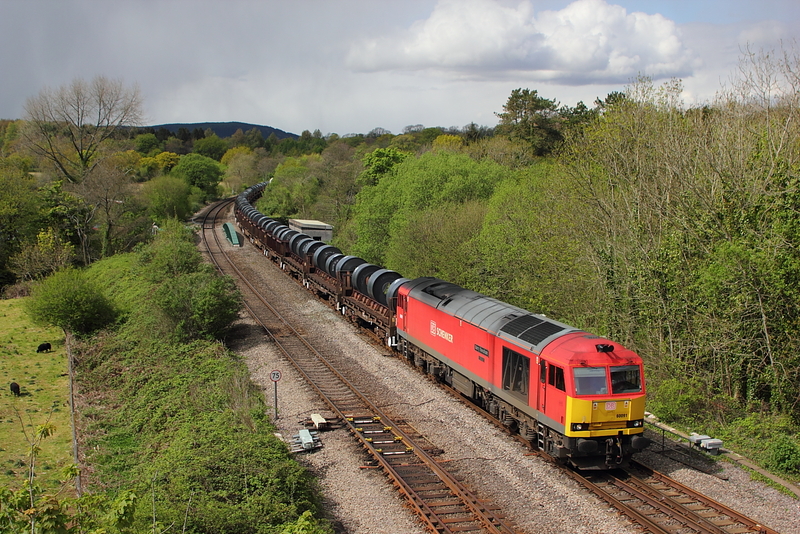 60074"Teenage Spirit",departs from the loop at Haresfield,and continues to Westerleigh with 6B13,the loaded murco tanks from Robeston. 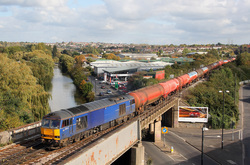 Beleive it or not,the sky in the distance bears no resemblance to the bit that matters,ie. 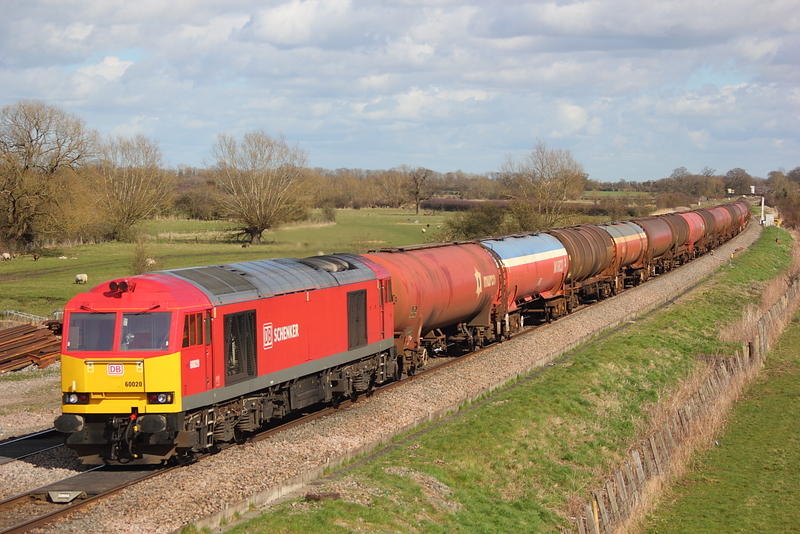 right behind us,where the sun is and this area seemed to attract the only cloud of the day,so there was plenty of nail biting awaiting 60011 on 6B47 passing,Purton on the Westerleigh to Robeston empty murco tanks,thankfully fully lit. 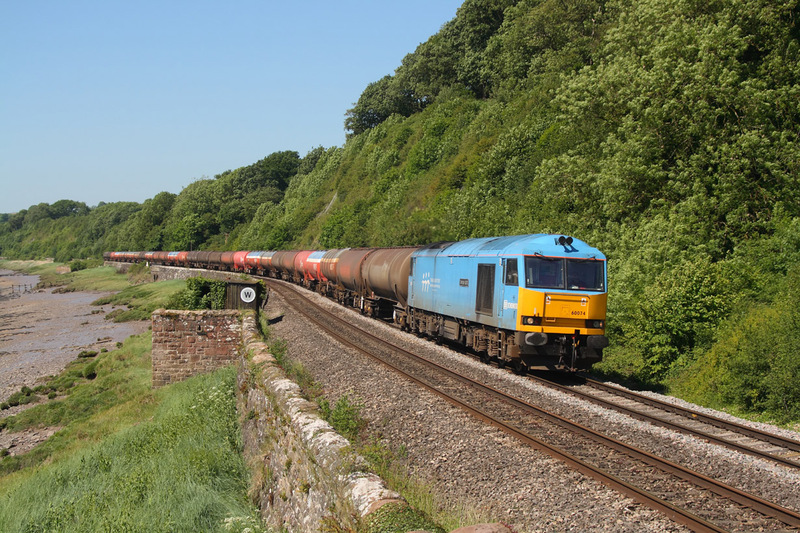 Having seen 60099 earlier on a Margam to Llanwern steel trip,it was just a case of awaiting the return,as depicted here with the tug entering the sunshine from Hillfield tunnel,Newport with 6B04,the return empties back to Margam. 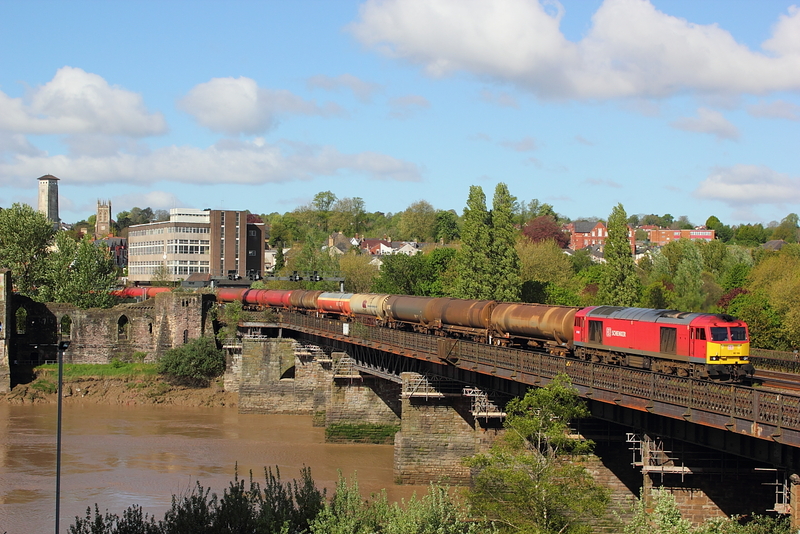 "Vindaloo" tug,60099 passes East Usk on 6B03,Margam to Llanwern loaded steel. 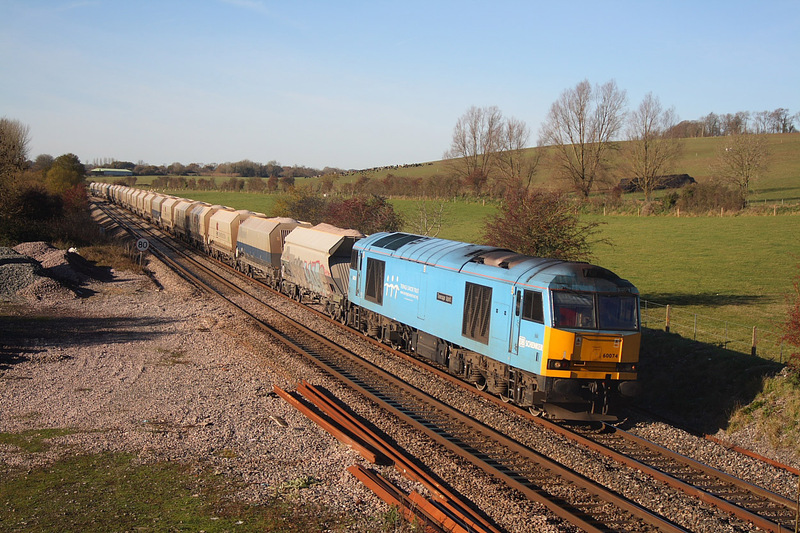 Bit of an educated guess,to what the loco would work today,in between the Theale murco diagrams,but it paid off. 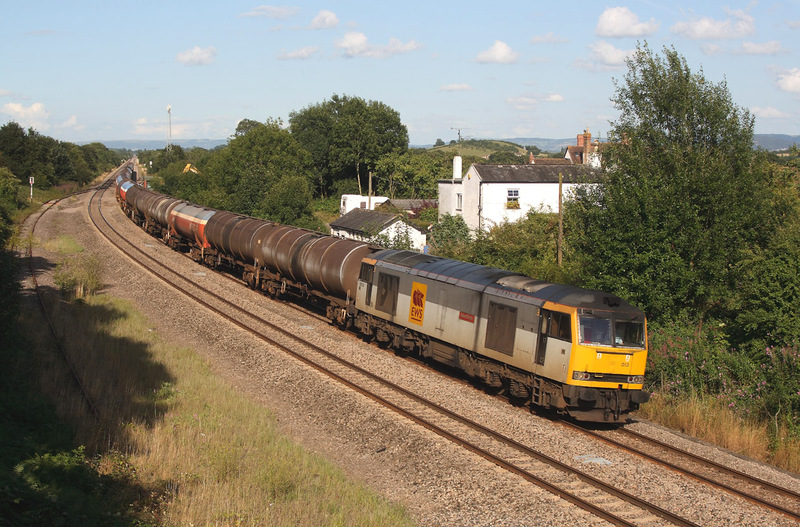 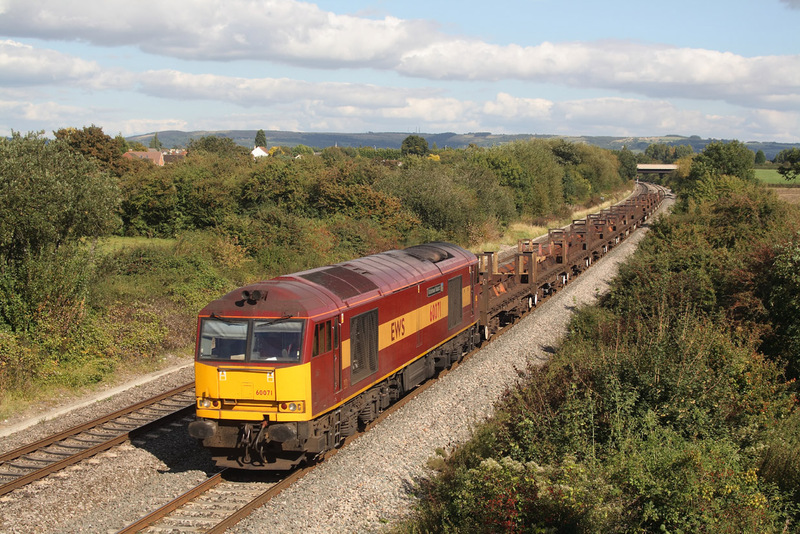 60011 runs up the main at Magor on 6B13, Robeston to Westerleigh loaded murco tanks. 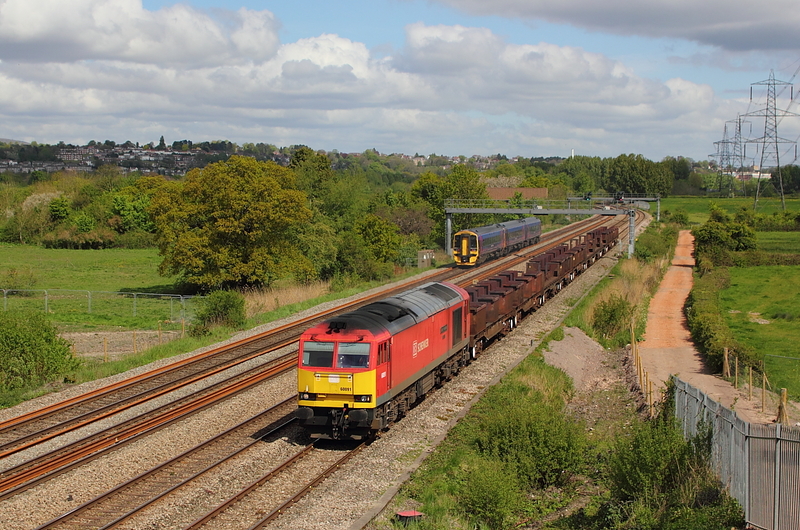 With the cloud only just clearing in time,60099 passes Denchworth with 6B33,Theale to Robeston murco empties. Having scraped 60099 entering the loop at Challow,a drive to Baulking,for a second stab was met with the same cloud,that only just cleared earlier,but lady luck was with me again as the sun reappeared at the critical time,with the tug passing on 6B13, the Theale to Robeston murco empties. 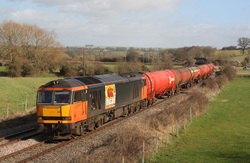 DBS liveried 60011 departs Haresfield loop with 6B13,the Robeston to Westerleigh loaded Murco tanks. 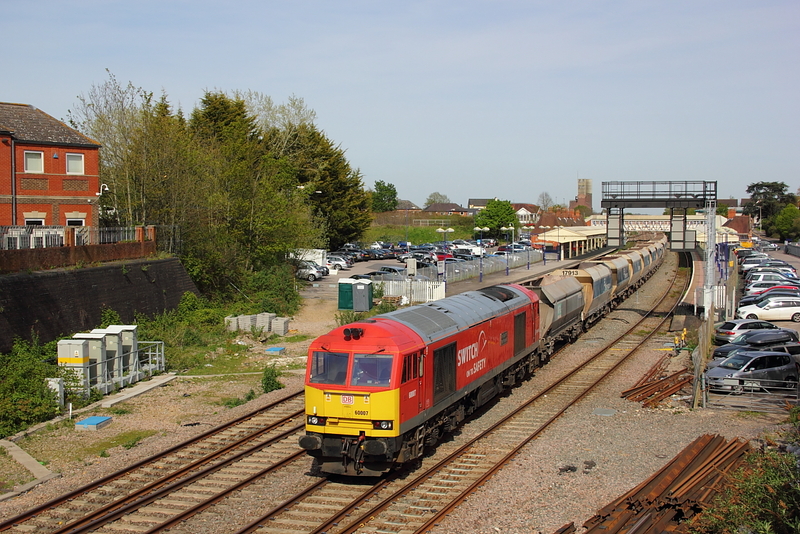 60040 "The Territorial Army Centenary" passes my home patch at Oakley,working 6o26 Hinksey to Eastleigh. 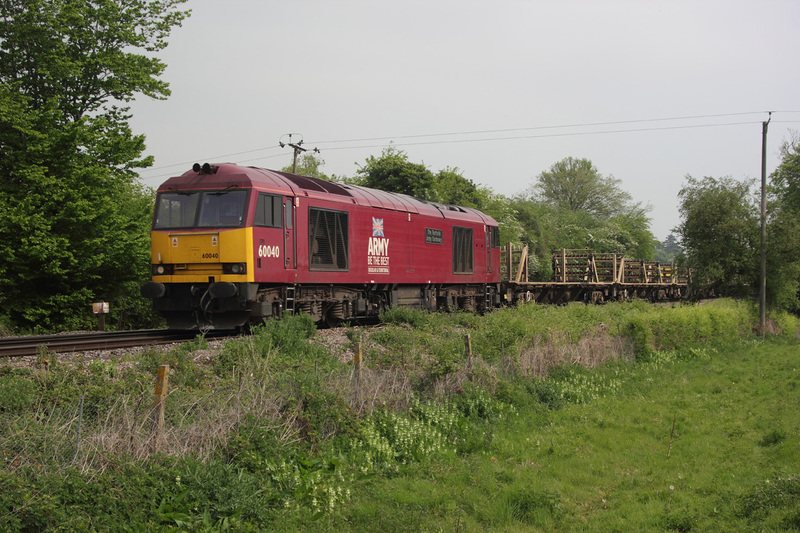 Army tug,60040"The Territorial Army Centenary",passes Dunsomer Hill on a late running 6V38,Marchwood to Didcot yard MOD service. 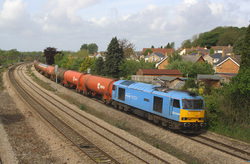 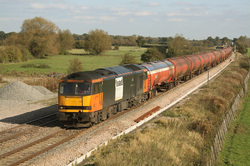 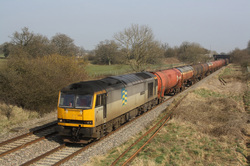 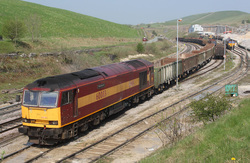 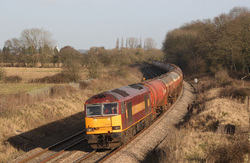 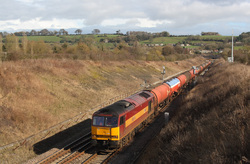 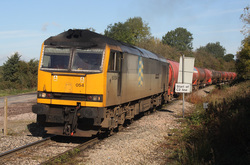 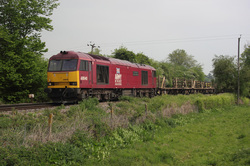 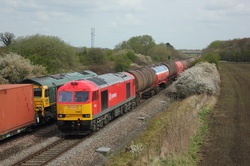 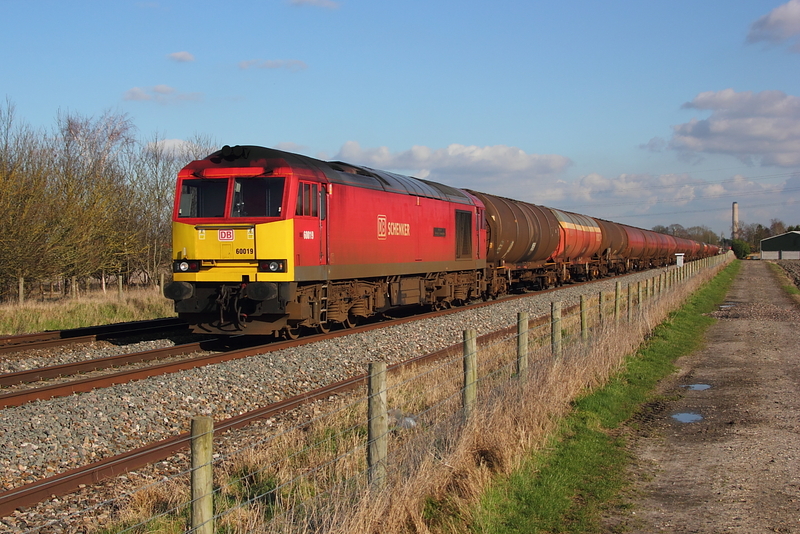 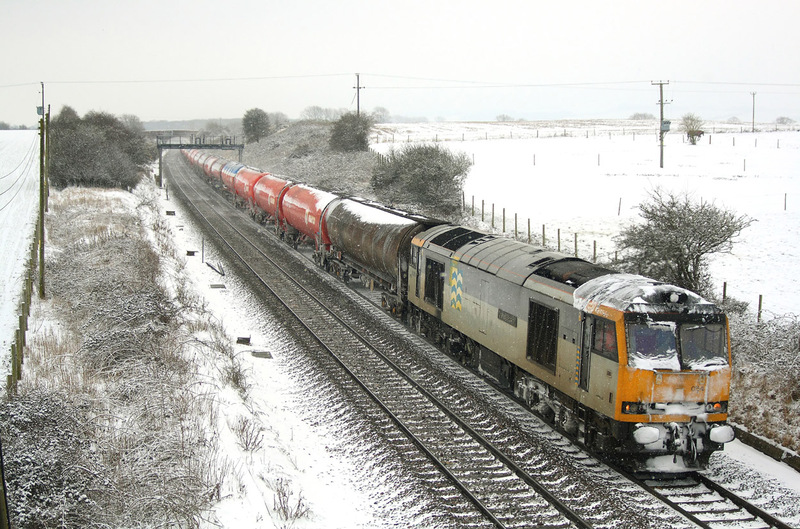 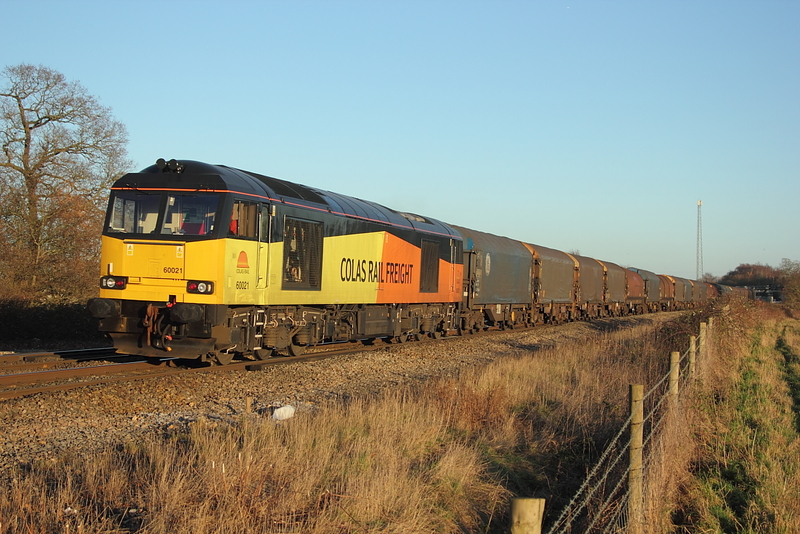 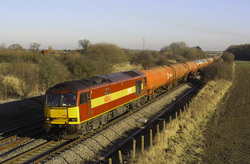 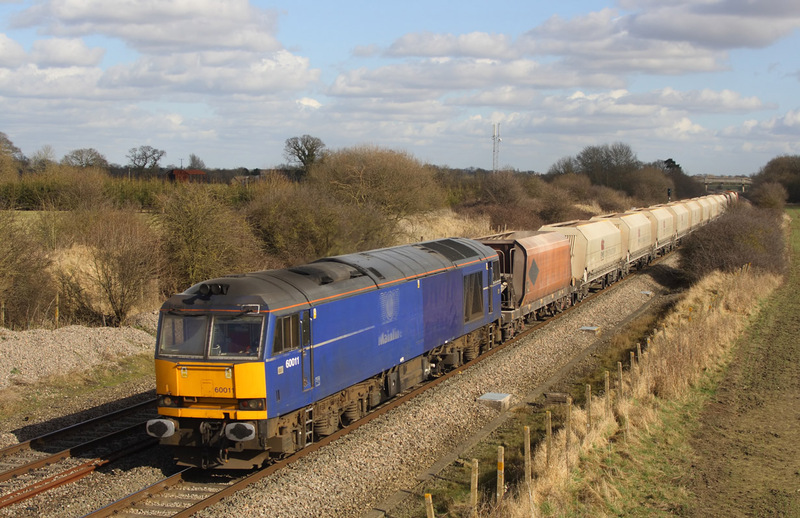 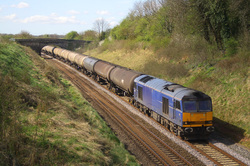 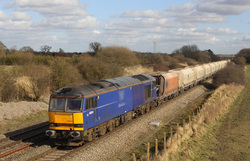 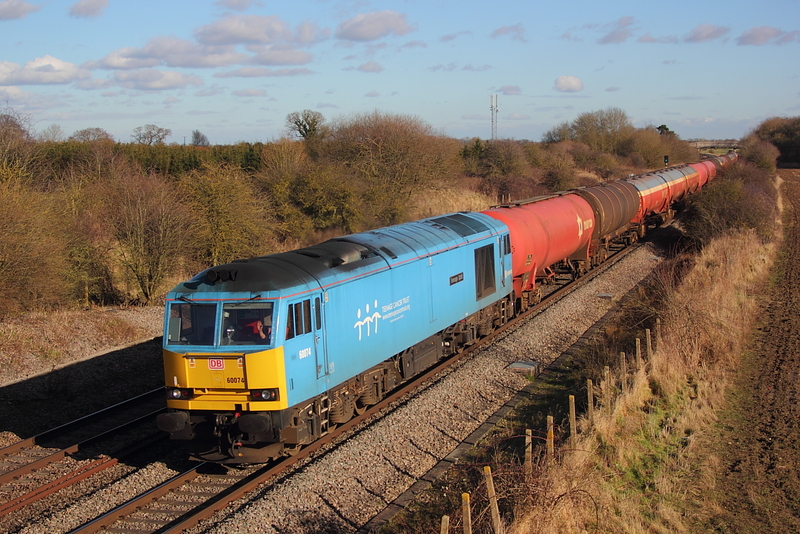 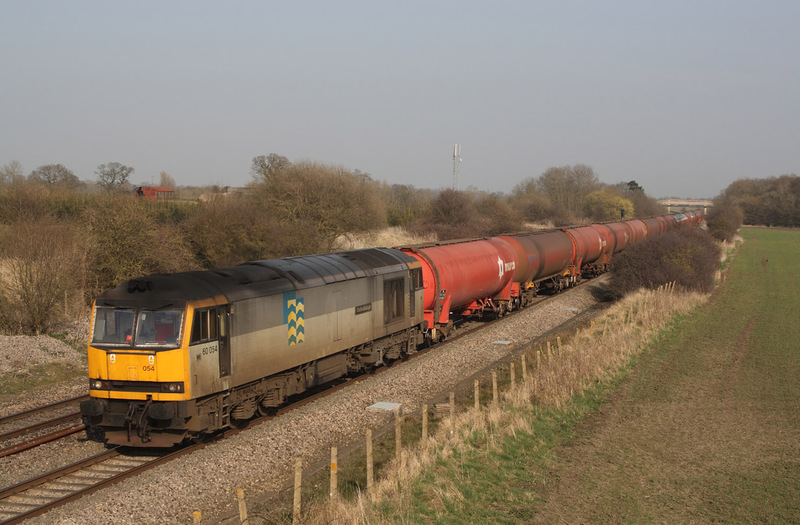 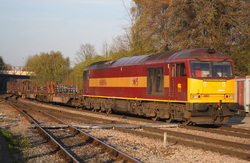 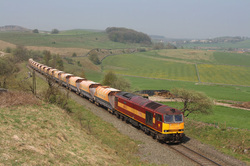 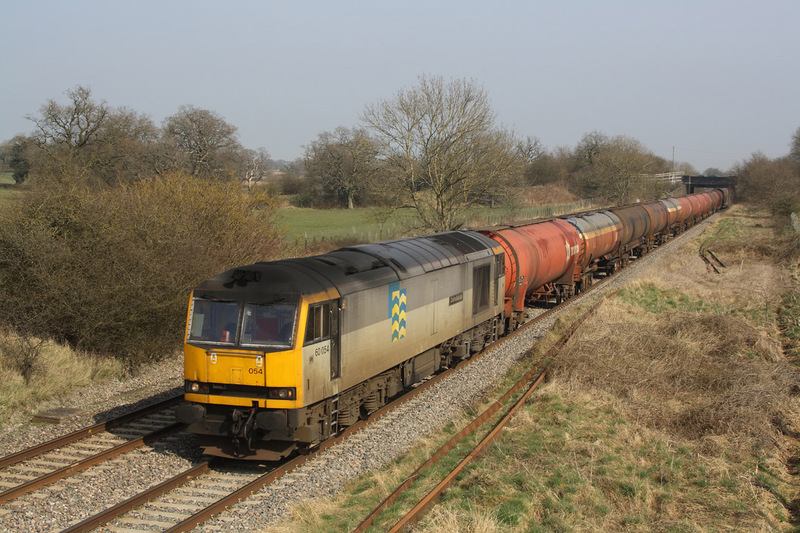 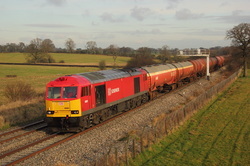 19/03/11 Badgeworth..60015 "Bow Fell" 6E41 Westerleigh to Lindsey empties. 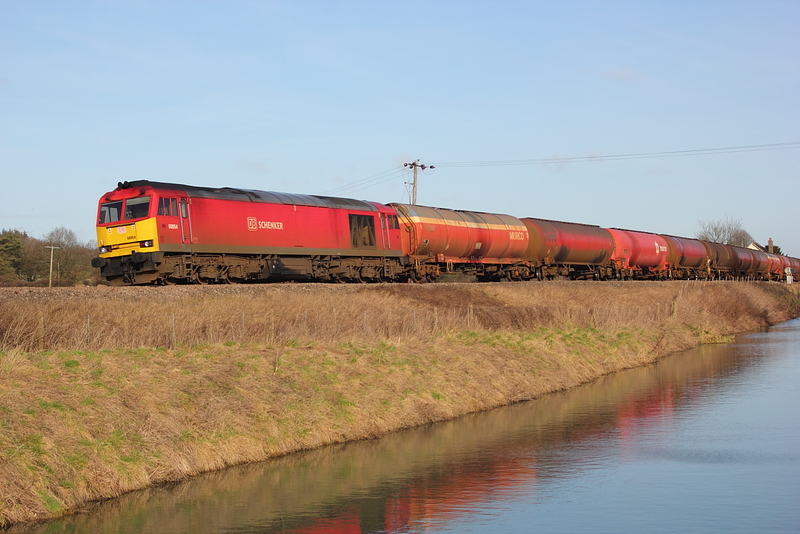 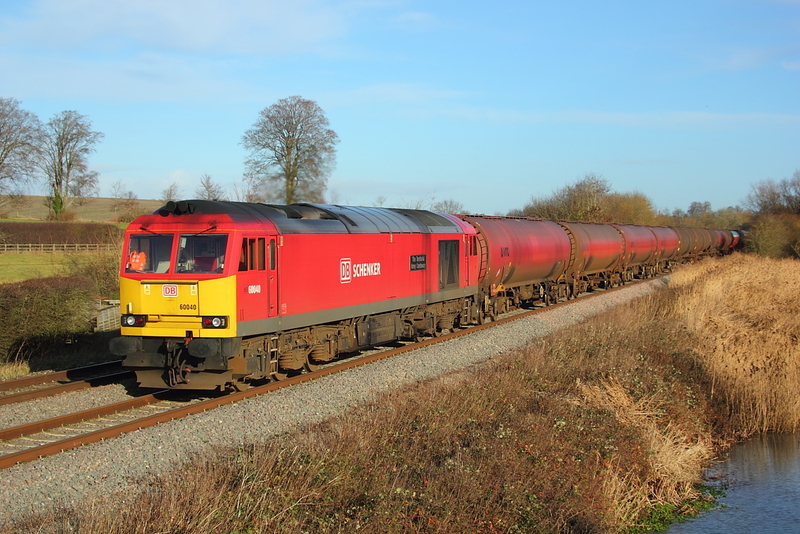 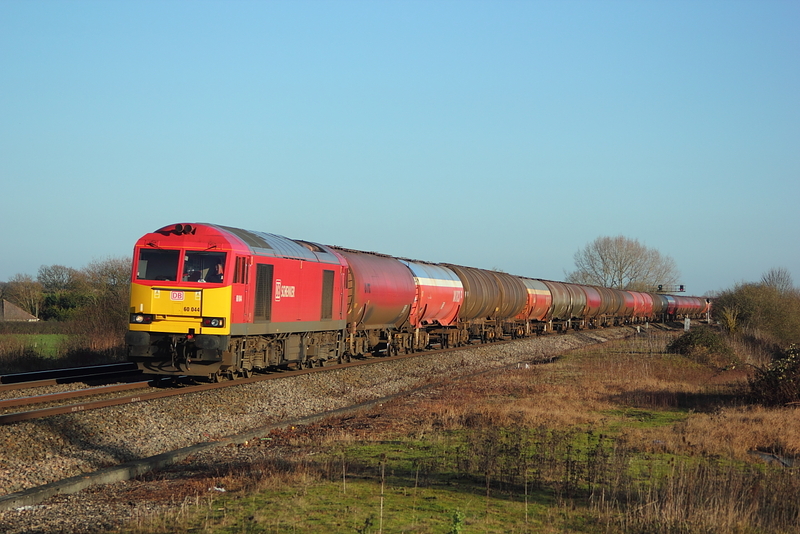 26/02/11 Chipping Sodbury,60096..6B33 Theale to Robeston murco empties. 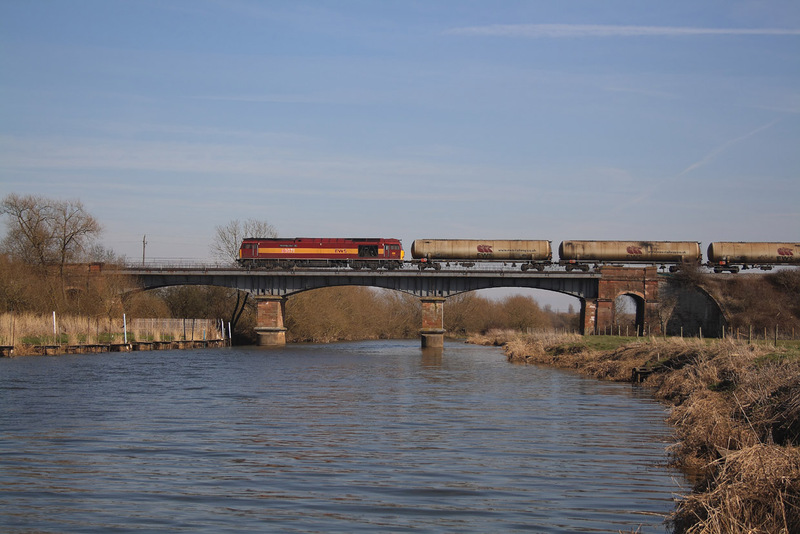 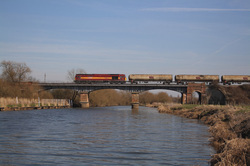 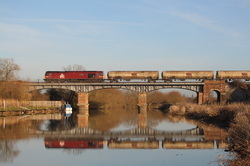 19/01/11 ..60040 "The Territorial Army Centenary" 6E41 Westerleigh to Lindsey empties passes over the River Avon,at Eccington,having already seen it at Gossington,running late. 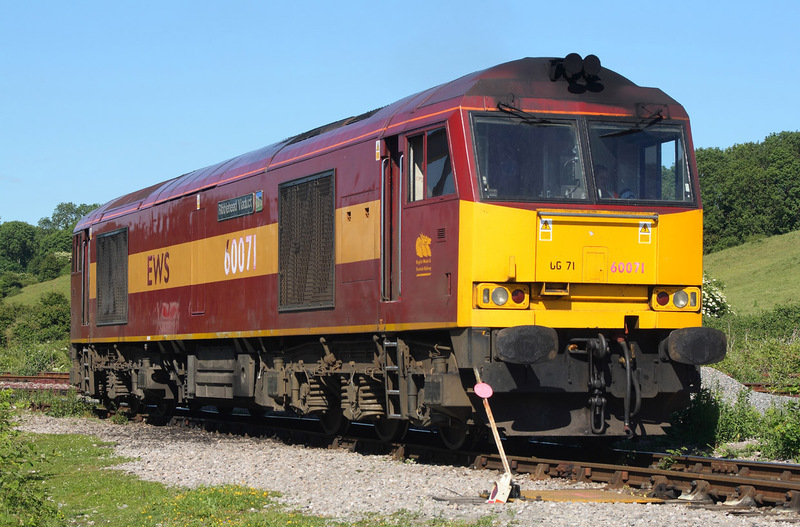 Glad i made the effort to get recently repainted 60011,as days later it was gone and would'nt return south for some time. The loco in question passes by at Gossington working 6B13,the Robeston to Westerleigh loaded murco tanks. Last shot of the sole remaining tug in original sector decals,ie 50054 "Charles Babbage" passes a snowstorm at Bourton whilst in charge of 6B13,the Theale to Robeston murco empties. 60074"Teenage Trust"passing Crofton on 6Z20 Whatley to St. Pancras loaded stone. 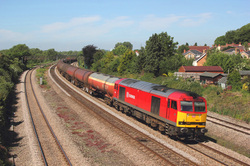 60096 Passing Swindon on 6B33 Theale to Robeston murco empties. 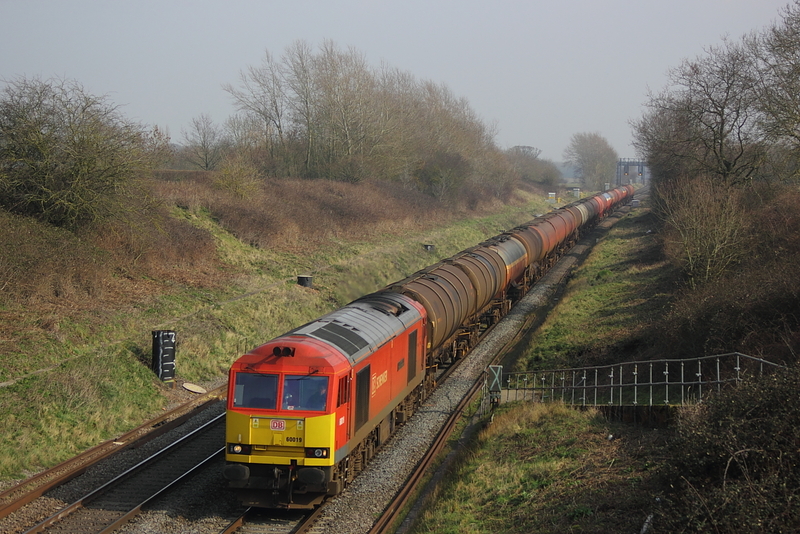 60010..6B33 Theale to Robeston empty Murco tanks. 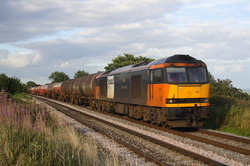 17/06/10 Westerleigh Murco fuel distribution depot. 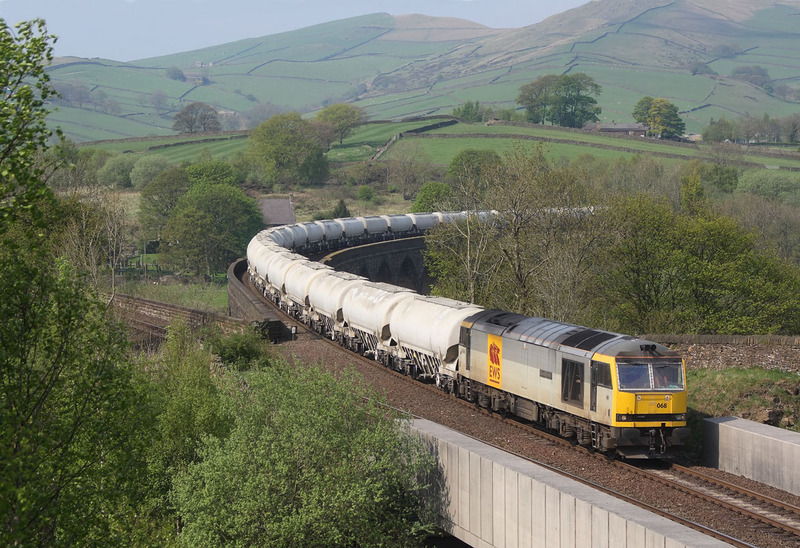 60071"Ribblehead Viaduct" awaits a driver for 6B47 ,returning the empty murco tanks to Robeston. 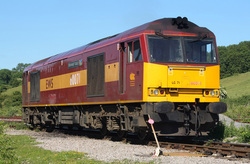 After sitting for nearly 45 min. 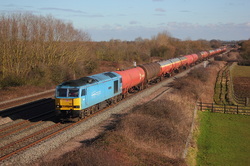 waiting for the road,60096 finally carries on its journey to Eastleigh with 6O15,the CWR train from Scunthorpe Trent. 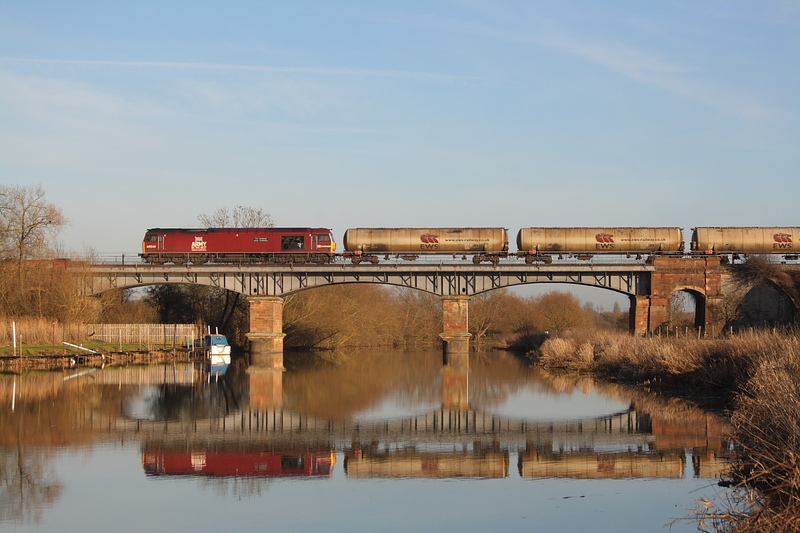 60071"Ribblehead Viaduct" crossing over the River Avon at Eckington with 6E41,Westerleigh to Lindsey empty petroleum tanks. Appropiatley named 60085"Mini-Pride of Oxford"passes the Mini panel factory at Swindon whilst working 6B33,Theale to Robeston Murco empties. 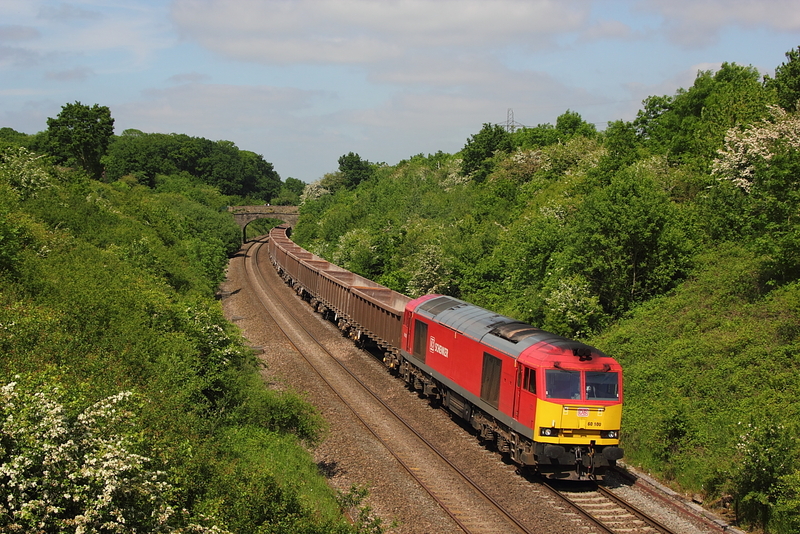 60063"James Murray" approaches the site,what was once Badminton station while working 6B33 Theale to Robeston Murco empties. 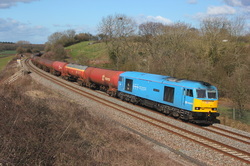 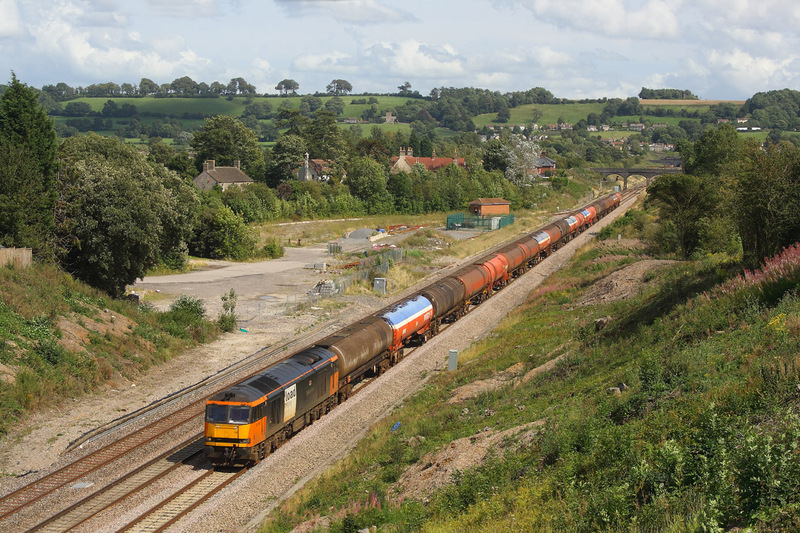 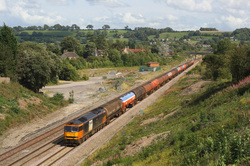 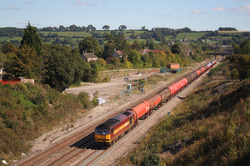 60011 on a diverted 6B33 Theale to Robeston,takes the road at North Somerset Jnct,Bristol. 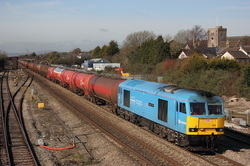 60054"Charles Babbage" the last operational locomotive of the class to retain its original sector livery,awaits entry to the Murco fuel distribution depot at Westerleigh with 6B13 from Robeston. 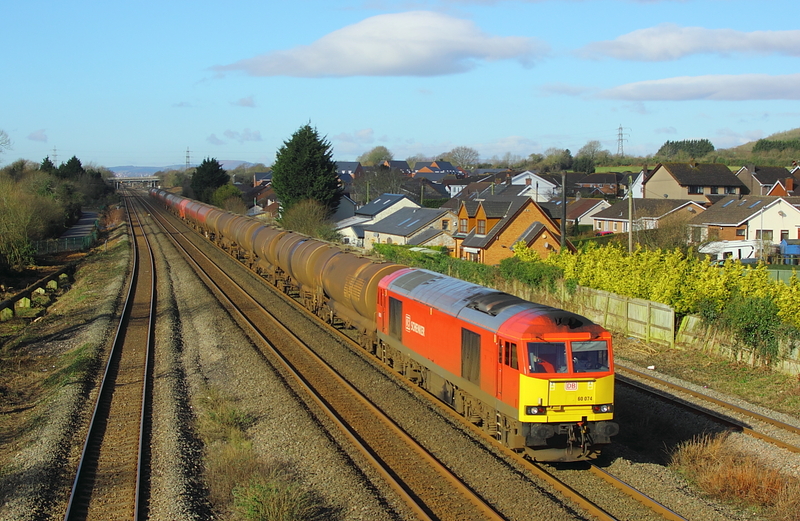 60054"Charles Babbage" trundles down the branch ,through the village of Westerleigh,heading for the nearby Murco fuel distribution depot,with 6B13 from Robeston. 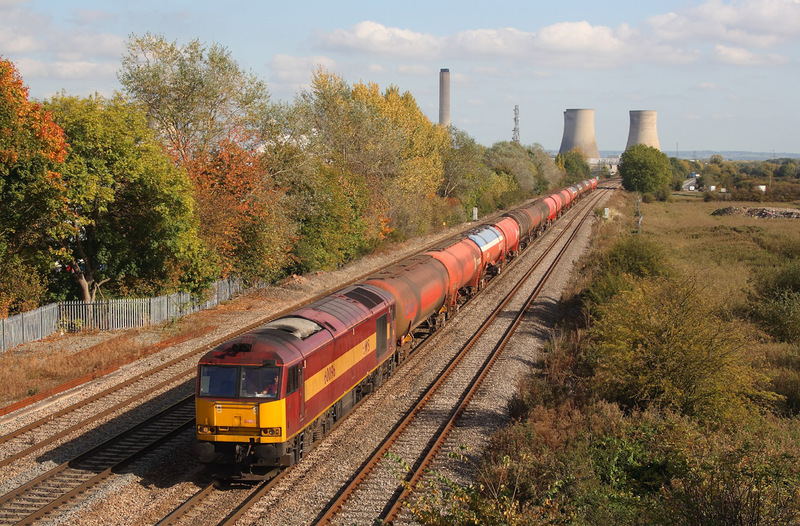 60096 Passes the Autumn colours at Milton,Didcot with 6B33,Theale to Robeston Murco empties. 60054"Charles Babbage" 6E41 Westerleigh to Lyndsey empties. 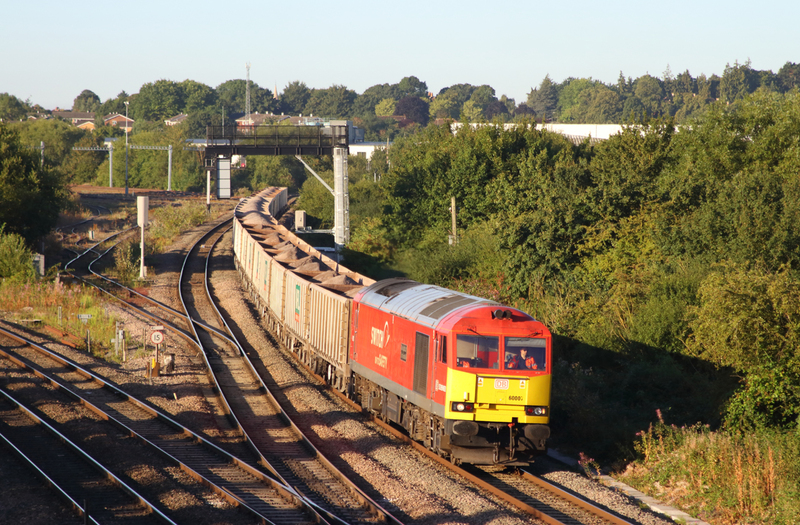 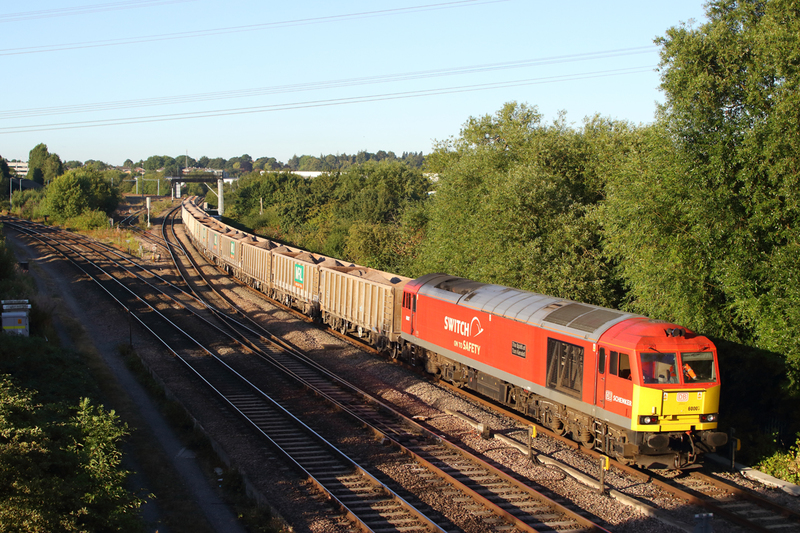 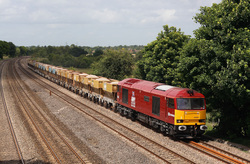 60009..6M34 Crawley to Peak Forest empty Cemex hoppers. 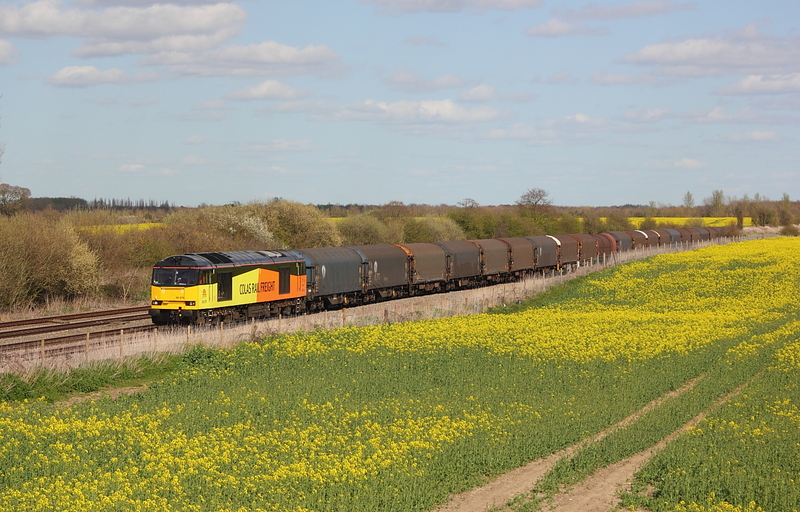 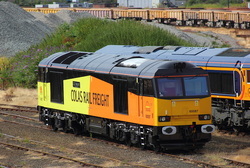 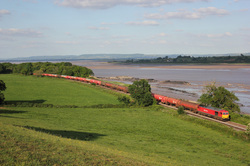 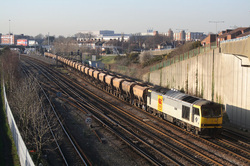 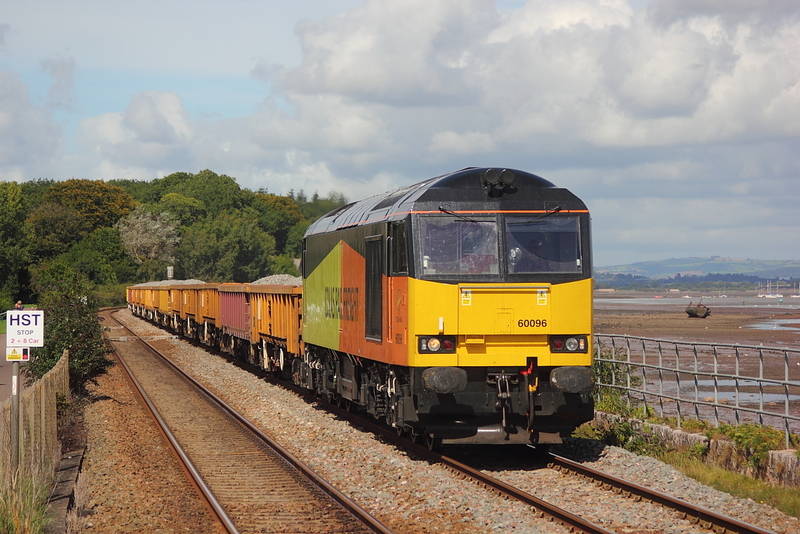 Having already got 60096 on the Fidlers Ferry coal circuit,the previous day,it was the Shanks liveried 66 targeted. On a,supposedley non Class 60 coal day,what turns up ,but 60096 in far better light,than the previous day, on a 6F80 Liverpool Bulk Terminal to Fidlers Ferry P.S. loaded coal. 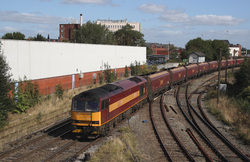 After a run round at Latchford sidings,60039 passes Warrington Arpley with 6F78 coal empties from Fidlers Ferry P.S. to Liverpool Bulk Terminal. 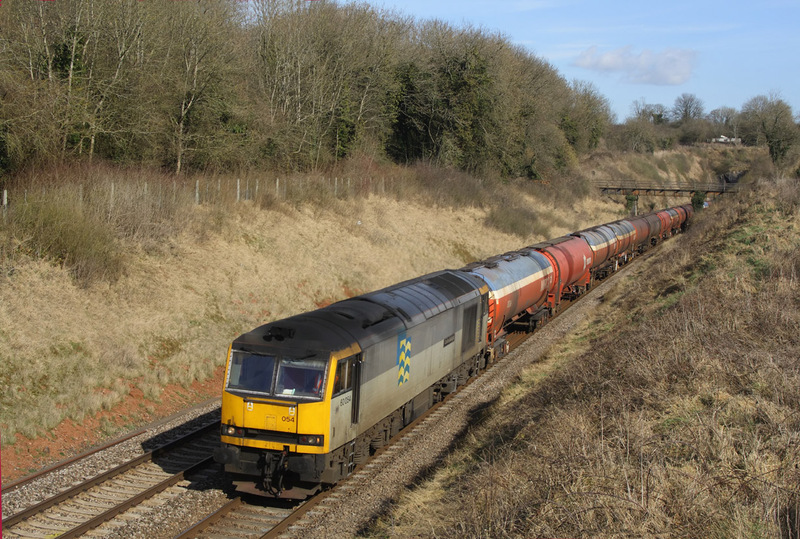 60059"Swinden Dalesman"6B33 Theale to Robeston Murco empties. 60040"The Territorial Army Centenary"6E41 Westerleigh to Lyndsey empties. 60059"Swinden Dalesman" 6B47 Westerleigh to Robeston empty Murco tanks. 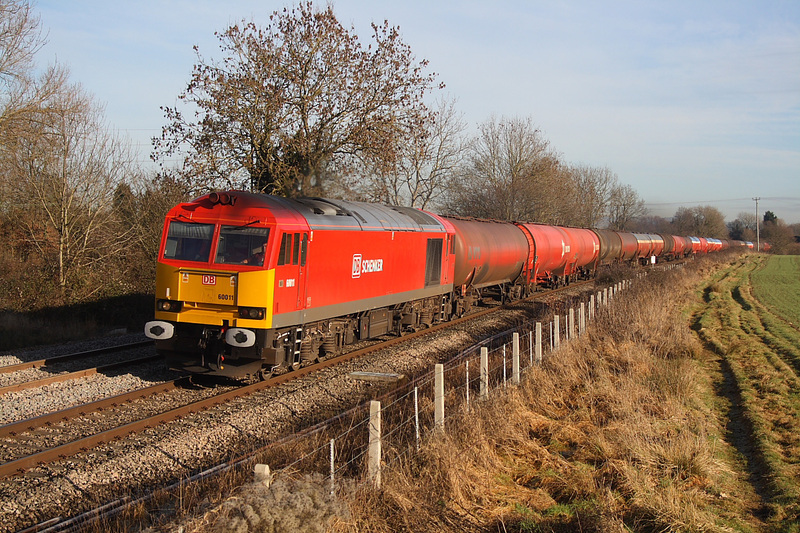 60013"Robert Boyle"6B47 Westerleigh to Robeston Murco empties. 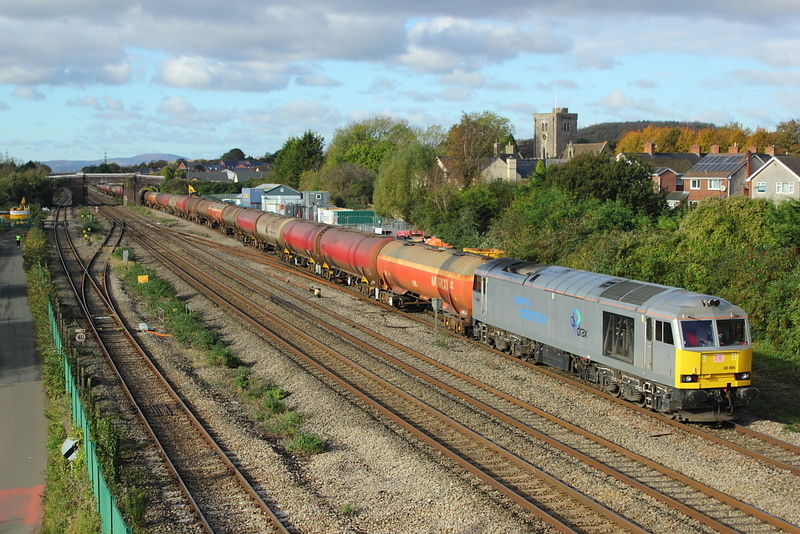 60013"Robert Boyle" 6B13 Robeston to Westerleigh loaded Murco tanks. 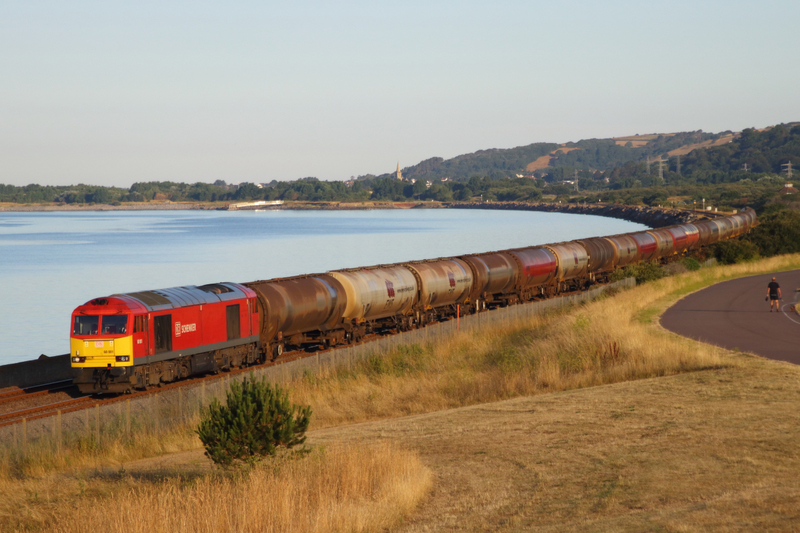 Around this time the only tugs in the area would be on the Murco tanks ,so it was a welcome change when 60087"Barry Needham" managed to get on the morning Hinksey to Eastleigh engineers,and even better when i managed to scrape the return 6V27 in the sun at Dunsomer Hill ,Sth. 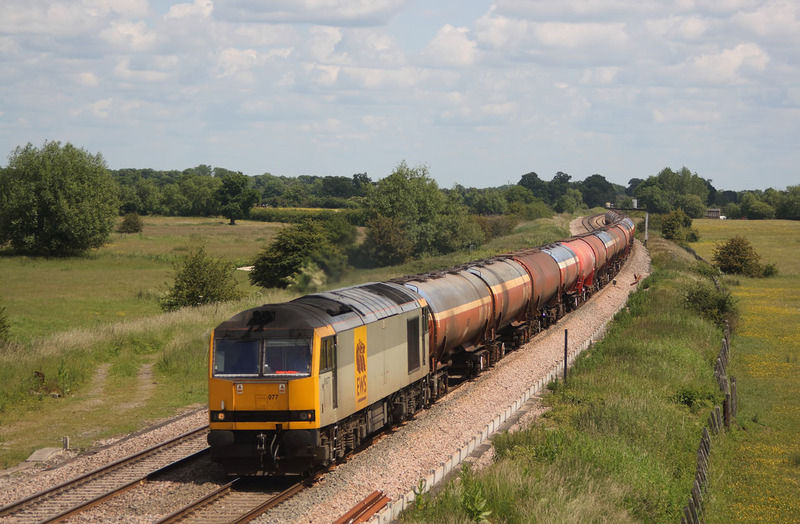 Moreton. 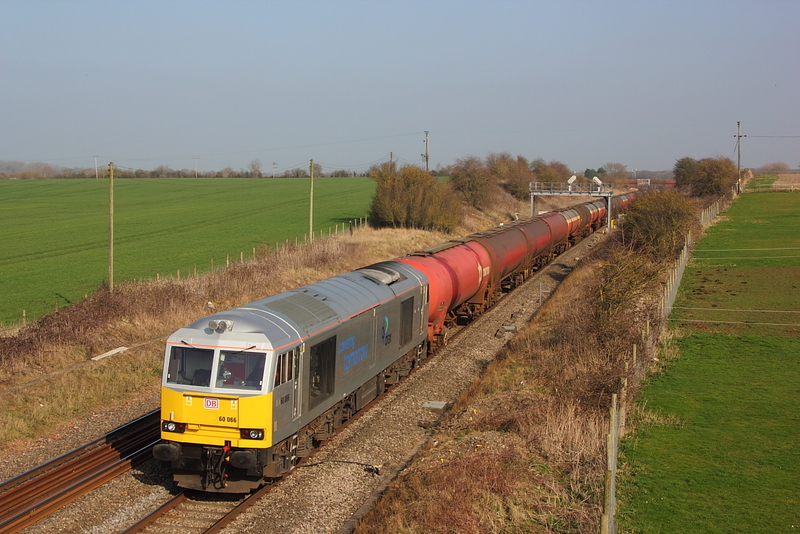 Still with its Transrail (faded)decals,60061"Alexander Graham Bell" passes Shrivenham on a late Saturday 6B33,Theale to Robeston Murco empties. 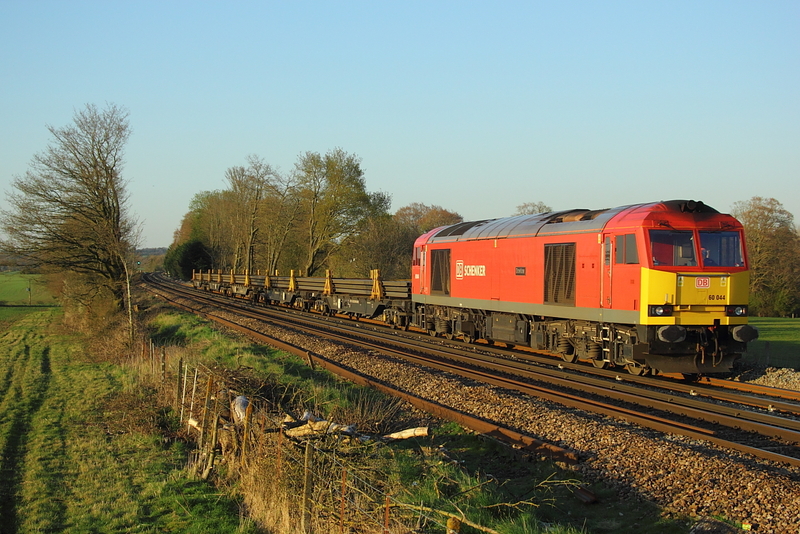 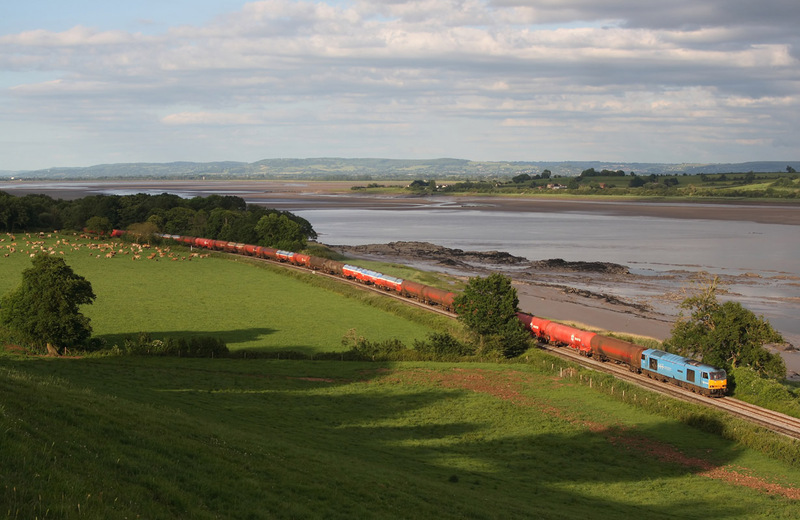 With the late evening shadows getting ever near to the line,60074 "Teenage Spirit"finaly passes Purton on 6B47,Westerleigh to Robeston Murco empties. 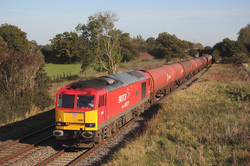 60074"Teenage Spirit" 6B13 Robeston to Westerleigh loaded Murco tanks. 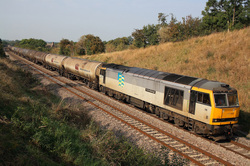 After photting 60074 at Gatcombe,Glos. 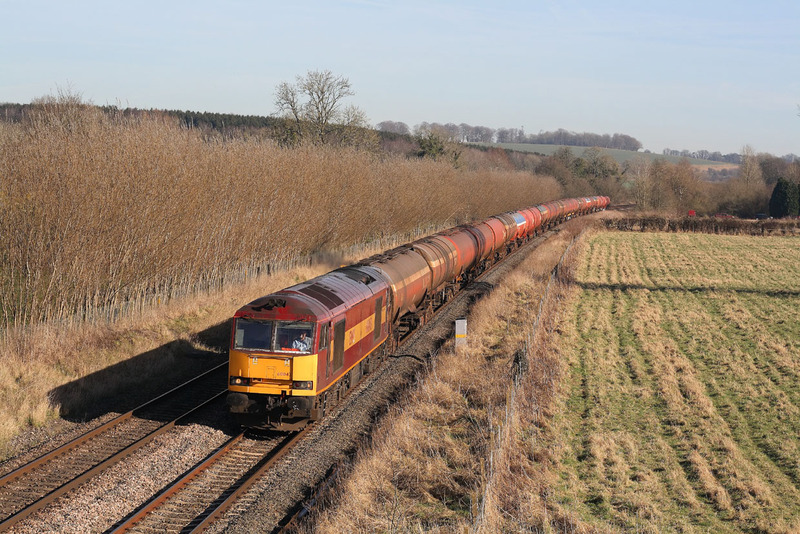 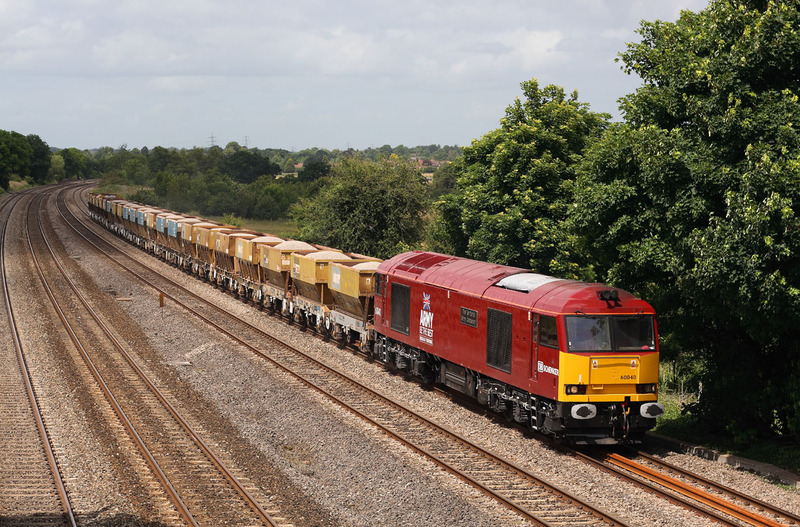 a madcap drive to this location at Wellingborough,was questioning ones sanity ,but when 60059"Swinden Dalesman" passed on the Saturday 6M34,Crawley to Peak Forest Cemex empties,it was worth it,and having seemingley been glued to this working, never done it again. 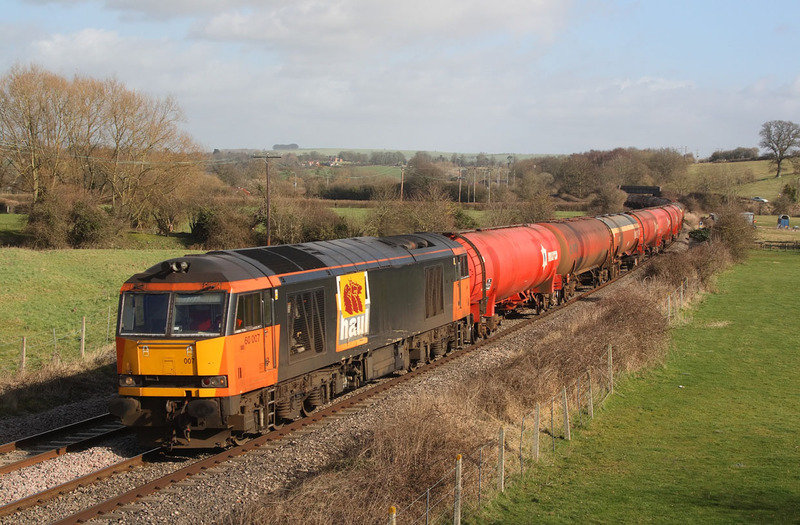 After being in traffic for over ayear,and after many failed attempts,i finaly managed to photograph the repainted tug,60074"Teenage Spirit" and what better place than Gatcombe,whilst working a Saturday 6B13,Robeston to Westerleigh loaded Murco service. 60040"The Territorial Army Centenary"6E41 Westerleigh to Lyndsey empty tanks. 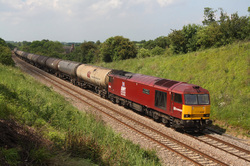 60074"Teenage Spirit" 6B13 Robeston to Westerleigh Murco loaded tanks. 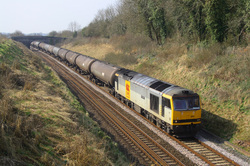 60065"Spirit of Jaguar"6B13 Robeston to Westerleigh loaded Murco tanks. 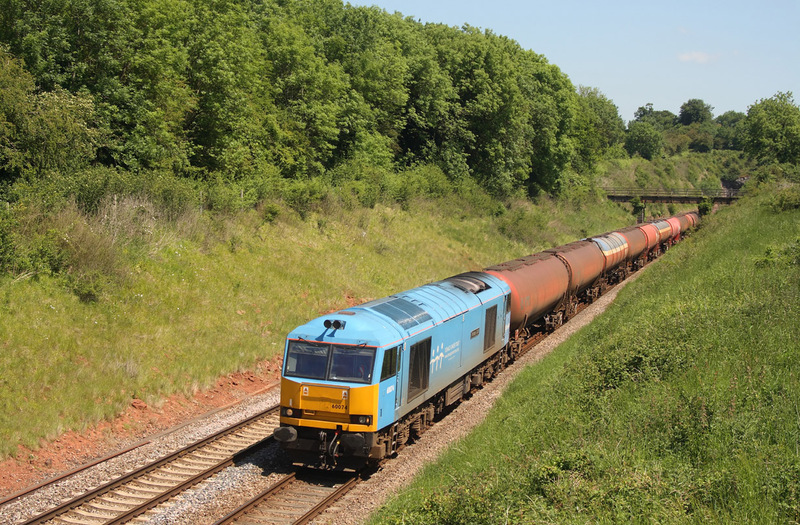 60011..6E41 Westerleigh to Lindsey empties. 60054"Charles Babbage"6B33 Theale to Robeston Murco empties. 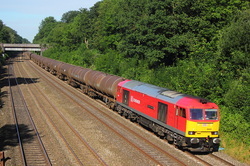 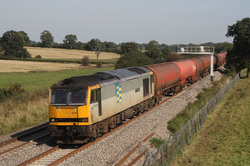 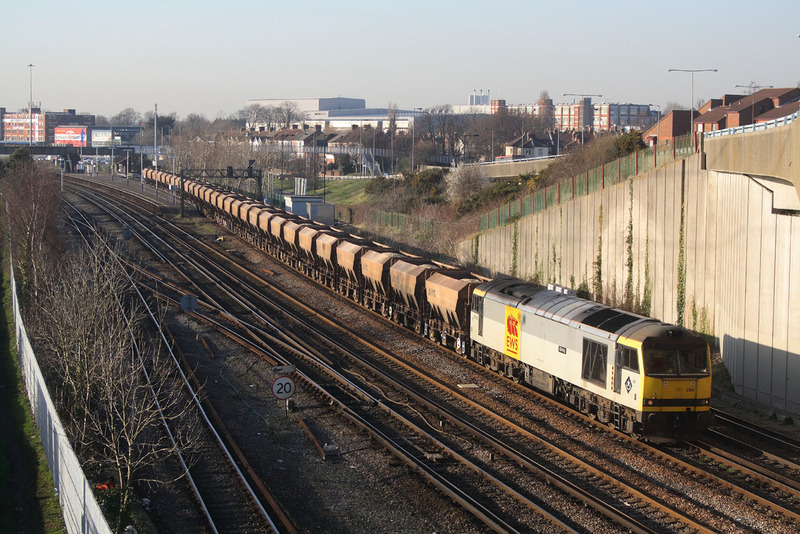 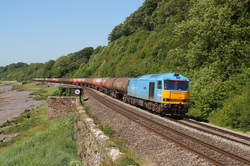 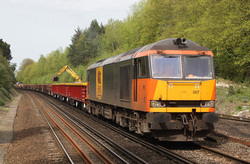 60031"ABP Connect"6B13 Robeston to Westerleigh loaded Murco tanks. 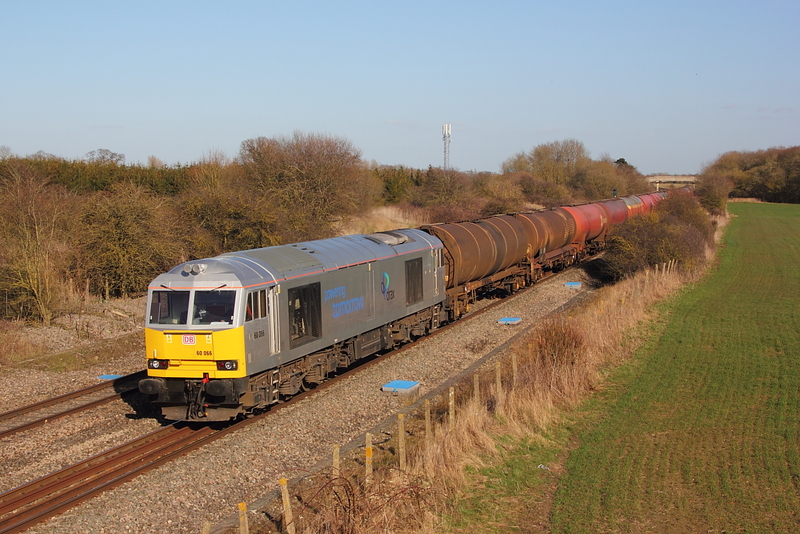 60091..6E41 Westerleigh to Lindsey empties. 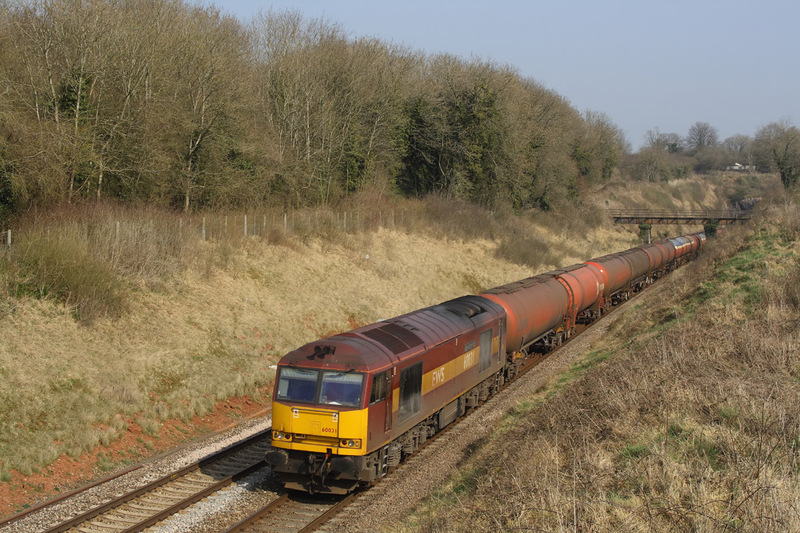 60054"Charles Babbage" 6B33 Theale to Robeston Murco empties. 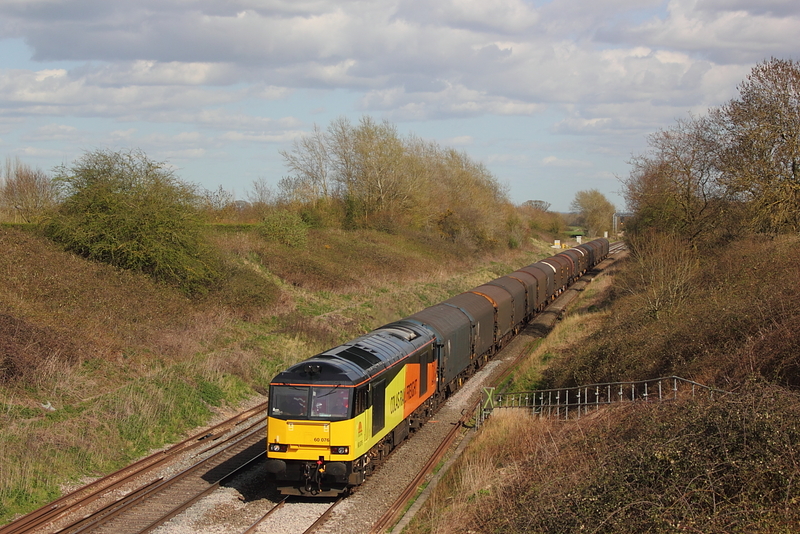 60011..6B35 Hayes to Moreton On Lugg empties. 60054"Charles Babbage"6B13 Robeston to Westerleigh loaded Murco tanks. 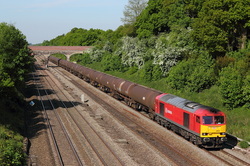 60085"Mini-Pride of Oxford" 6B33 Theale to Robeston empty Murco tanks,diverted via the B&H due to weekend engineering work being carried out in the Swindon area. 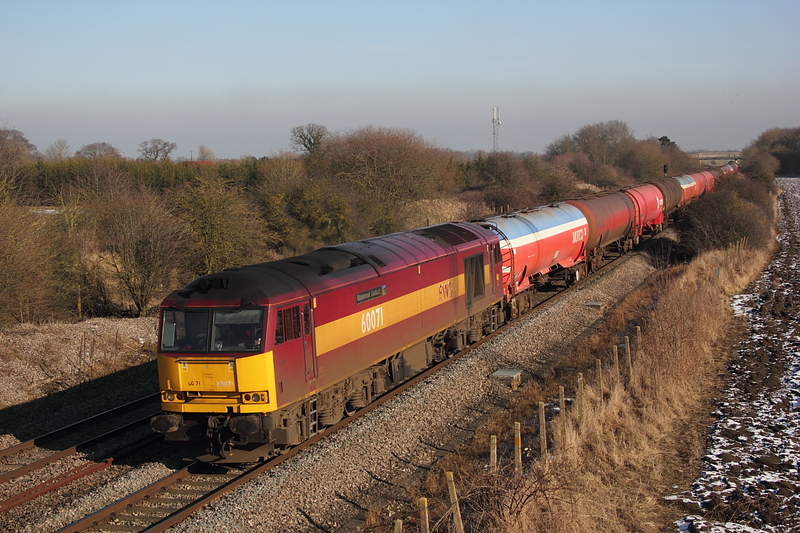 60085"Mini-Pride of Oxford" 6B33 Theale to Robeston Murco empties. 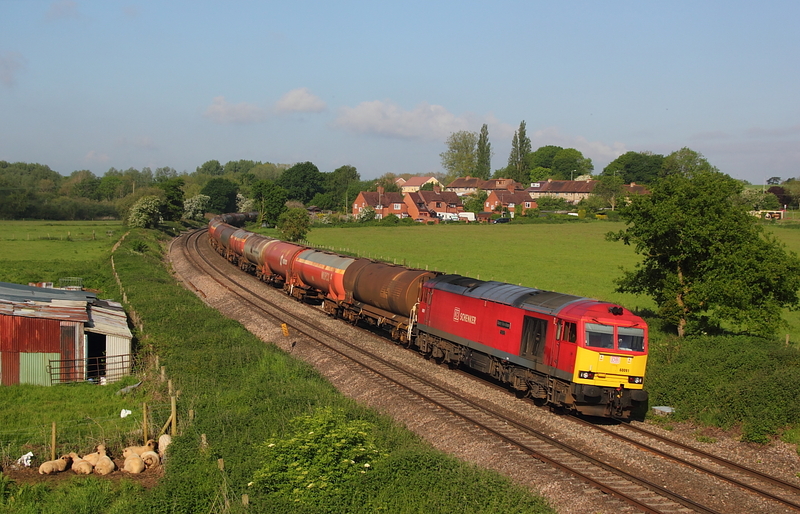 One tug that semed to have eluded me ,was 60045"The Permanent Way Institution",but finaly i managed to see it pass Catholme on an unexpected Mountsorrel to Crewe loaded ballast service. 60043 passes Catholme with a short 6M57 Lindsey to Kingsbury loaded fuel service. 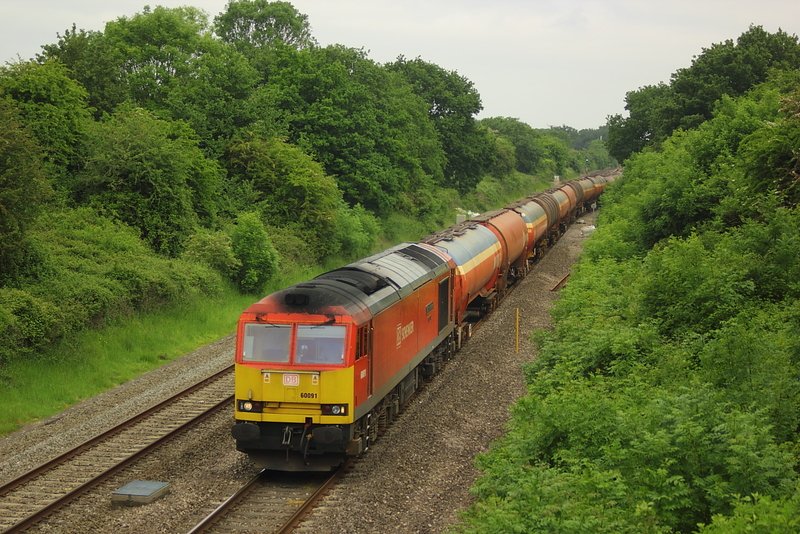 60002"High Peak" 6B33 Theale to Robeston Murco empties. 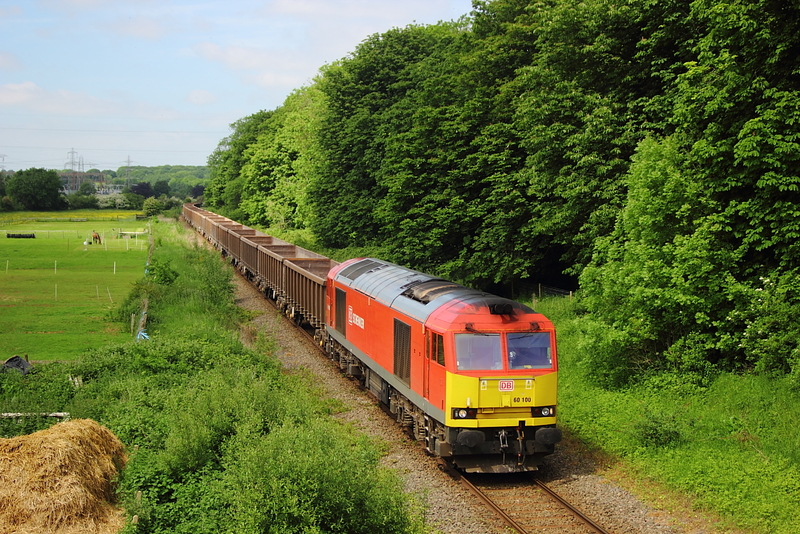 60040"The Territorial Army Centenary" 6A57 Appleford to West Drayton loaded stone. 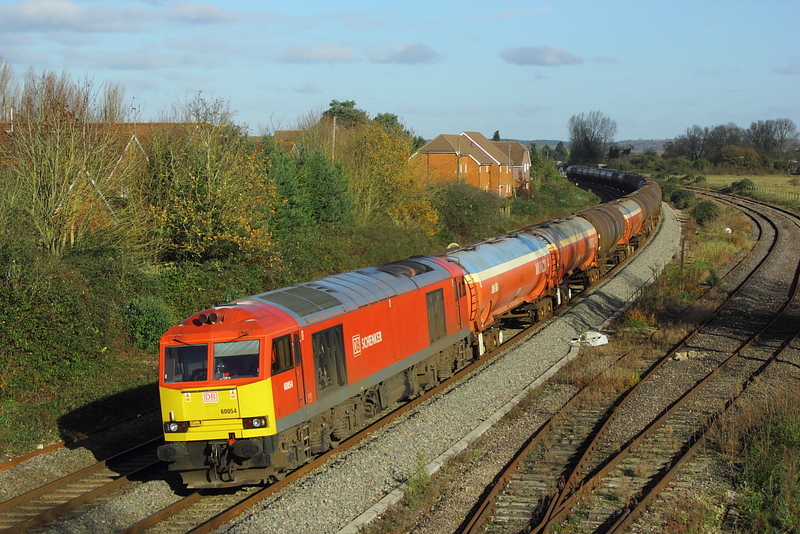 60077..6B33 Theale to Robeston Murco empties. 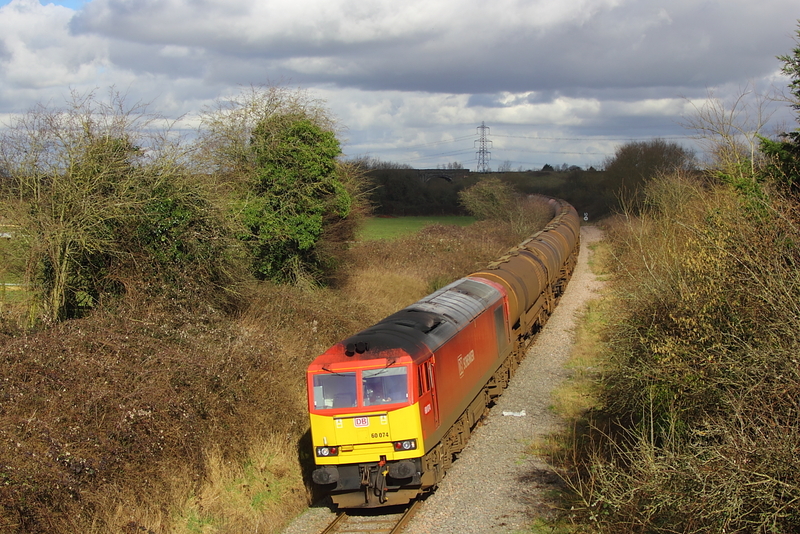 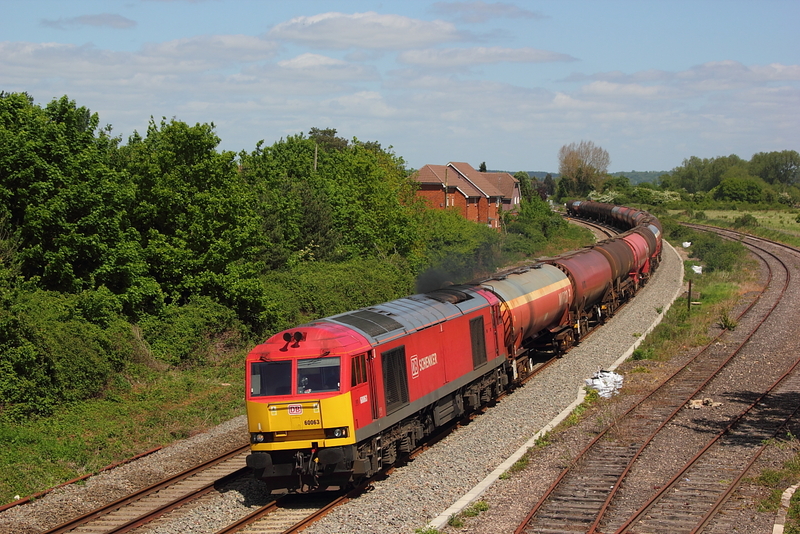 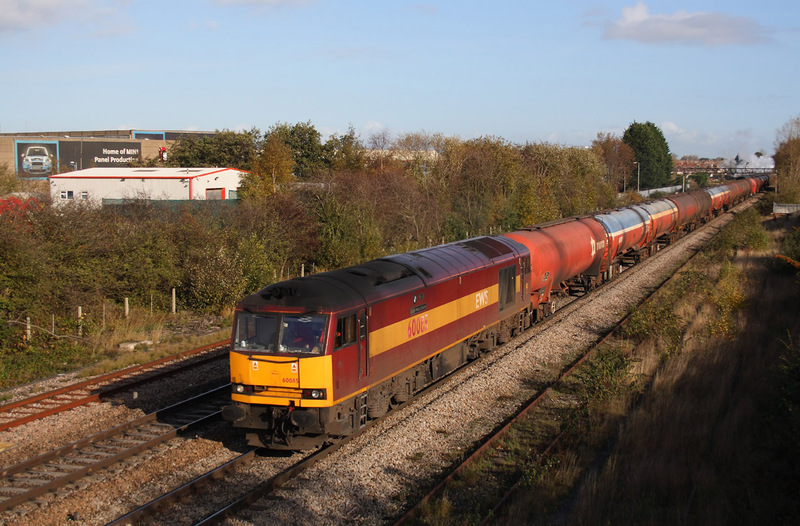 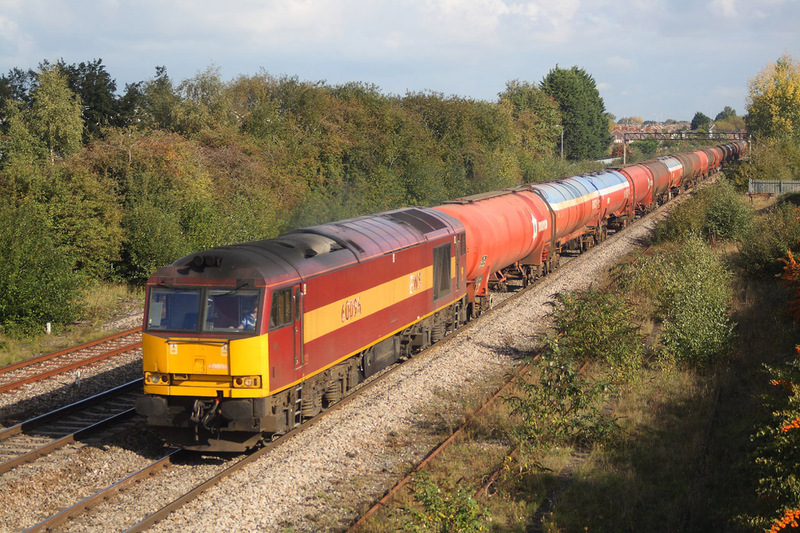 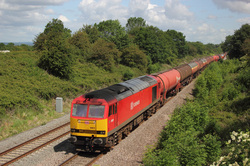 60076..6B33 Theale to Robeston Murco empties. 60068..6M82 Walsall to Tunstead cement empties. 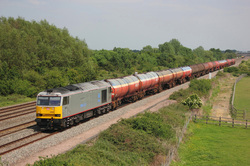 60083"Mountsorrel" 6H22 Tunstead to Hindlow loaded BLI hoppers. 60040..6H03 Oakleigh to Tunstead empties. 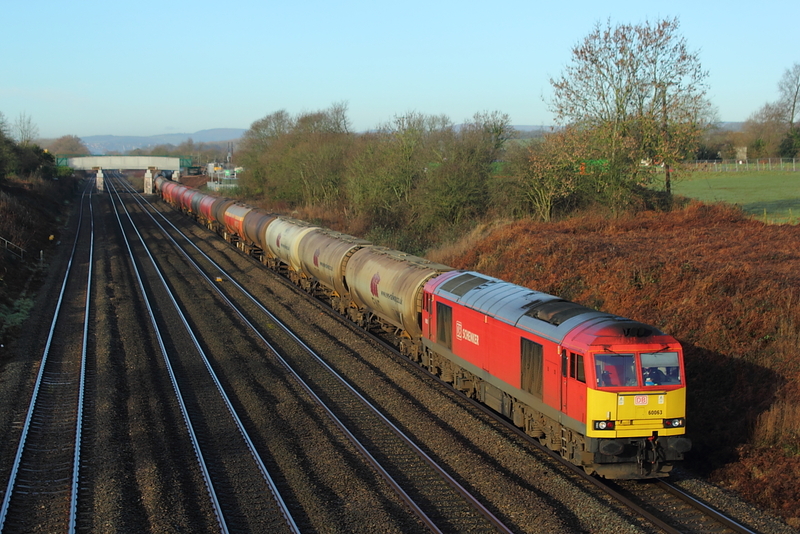 60020..6H43 Pendleton to Tunstead empties. 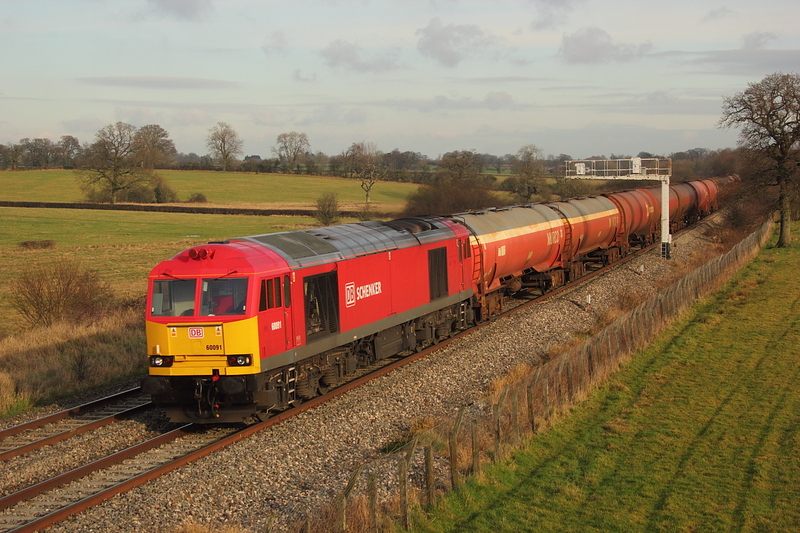 60068..6M22 Hunslett to Tunstead cement empties. 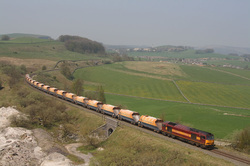 07/05/08 Chapel en le Frith. 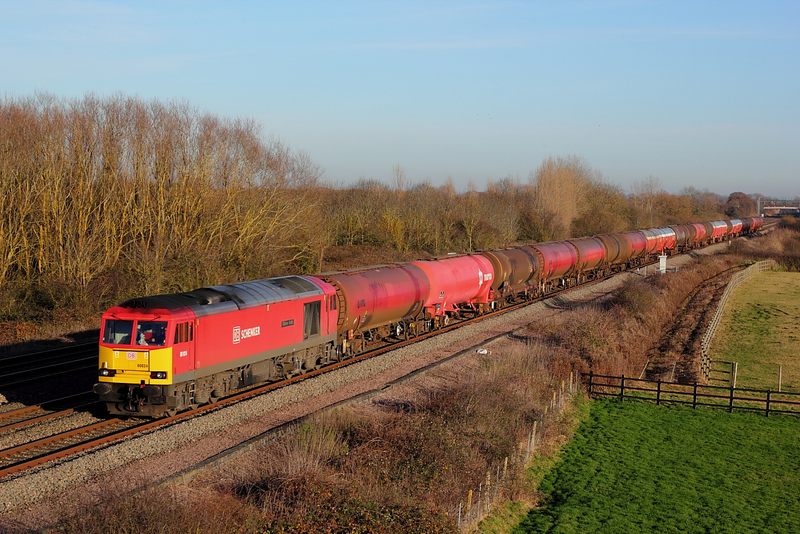 60040..6F06Tunstead to Oakleigh loaded limestone. 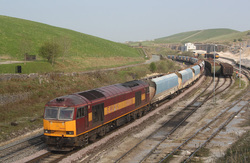 60029"Clitheroe Castle"6H60 Hope St. to Peak Forest empty Cemex hoppers. 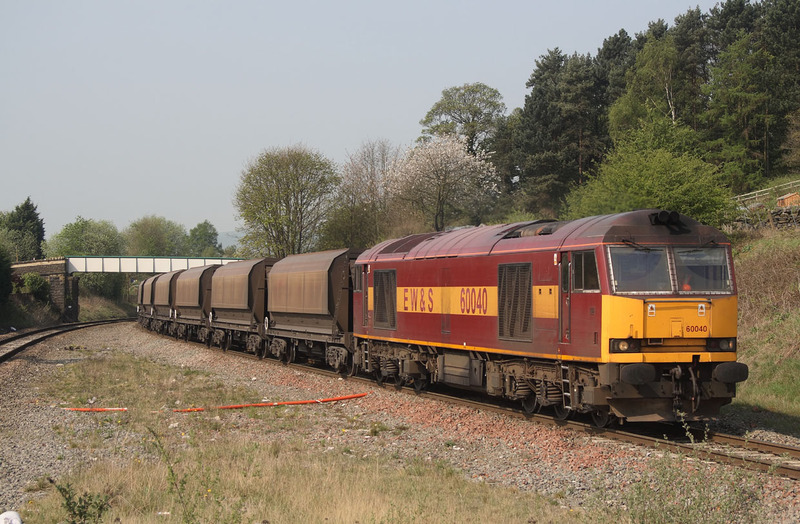 60020..6H22 Tunstead to Hindlow loaded BLI hoppers. 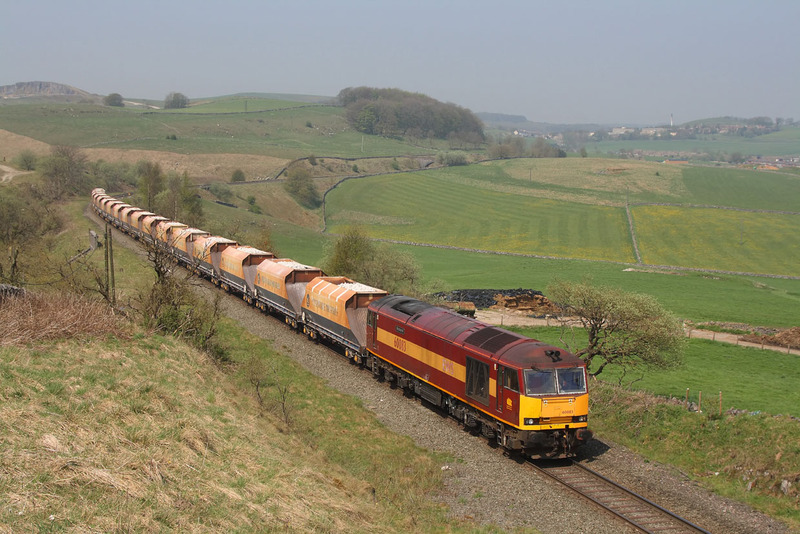 Veiwed from the old A6, 60020 passes Topley Pike, enroute to Hindlow,via a runround at Buxton with 6H22,loaded BLI hoppers from the Tunstead quarry. 60083"Mountsorrel" on shunting duties at Peak Forest. 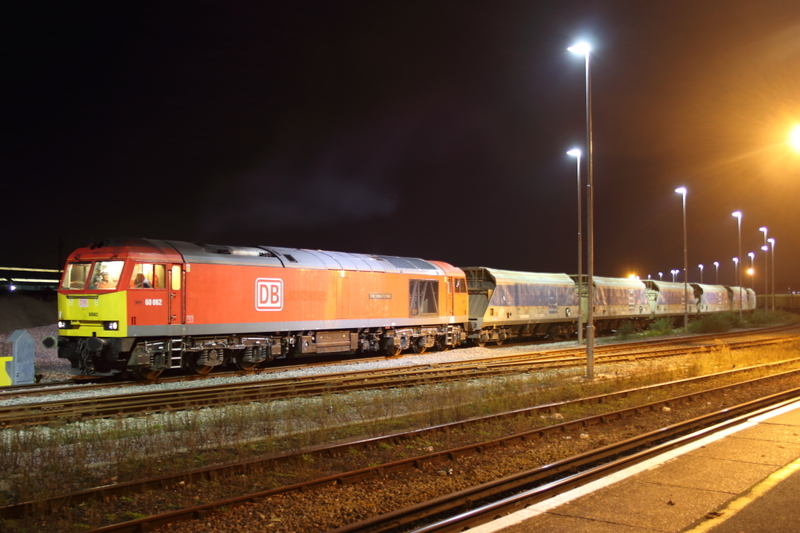 60007..6N04 spent ballast to Eastleigh yard,departing at 0005 Hrs. 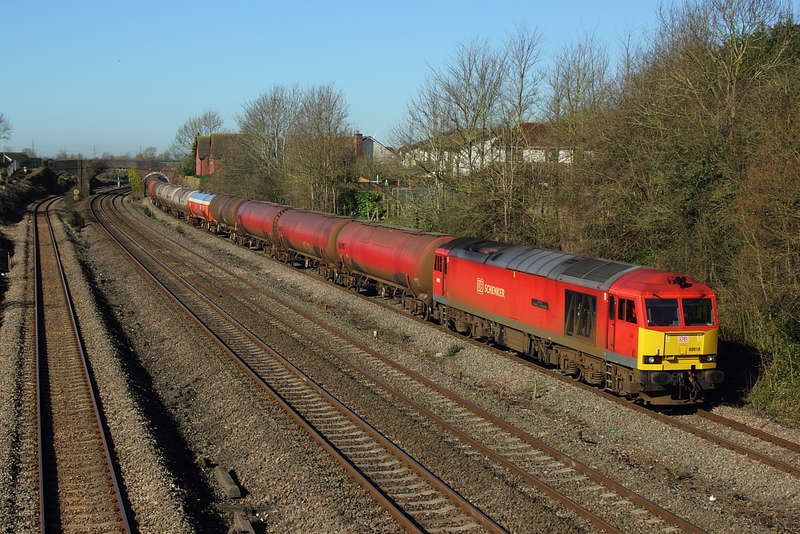 60007 on a Saturday 6B33 Theale to Robeston ,Murco empties,diverted via Newbury due to engineering work taking place at Swindon. 60059"Swinden Dalesman" on a Saturday diverted (via Newbury) 6B33 Theale to Robeston Murco empties. 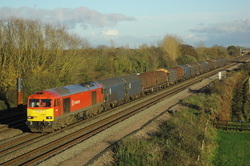 60090..6M57 Wool to Watford loaded sand. 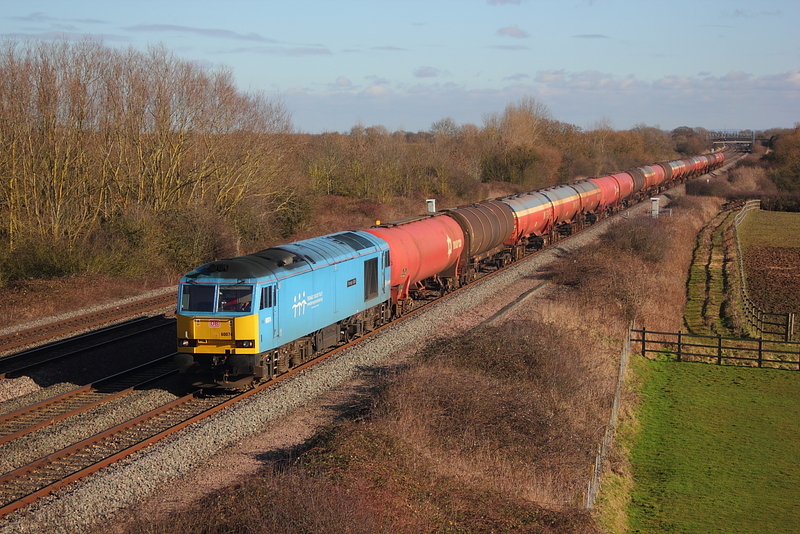 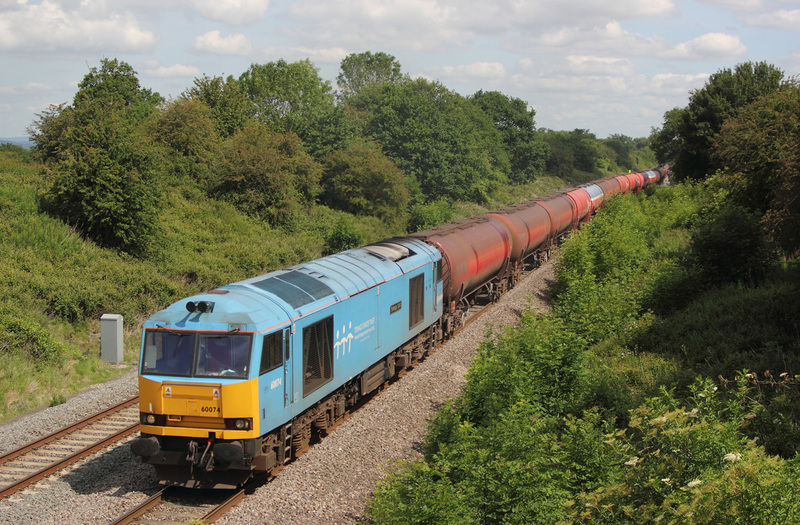 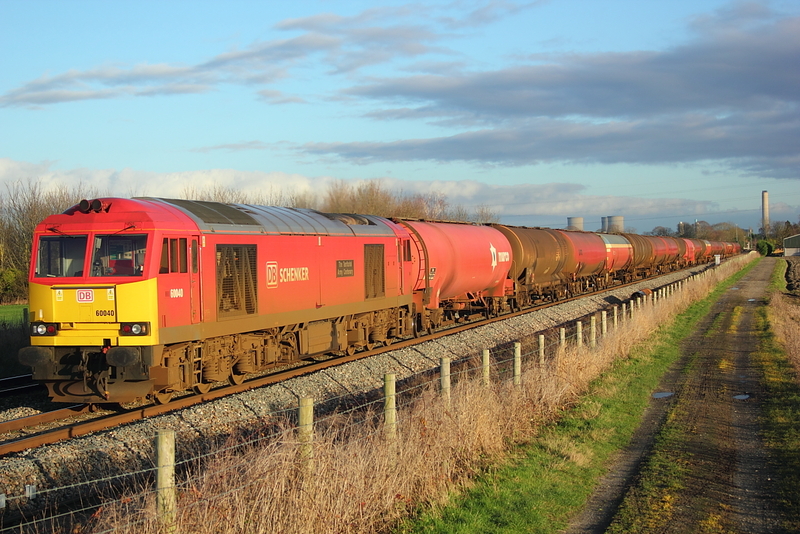 60043 Diverted Saturdays 6B33 Theale to Robeston Murco empties. 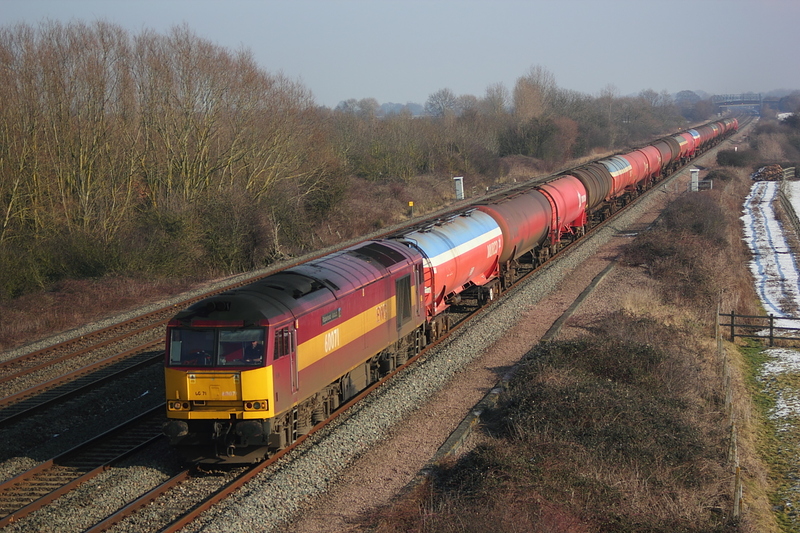 60020 On a Saturday diverted 6B33 Theale to Robeston Murco empties. 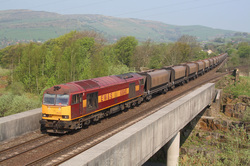 60071 "Ribblehead Viaduct" 6V92 Corby to Margam coil empties. 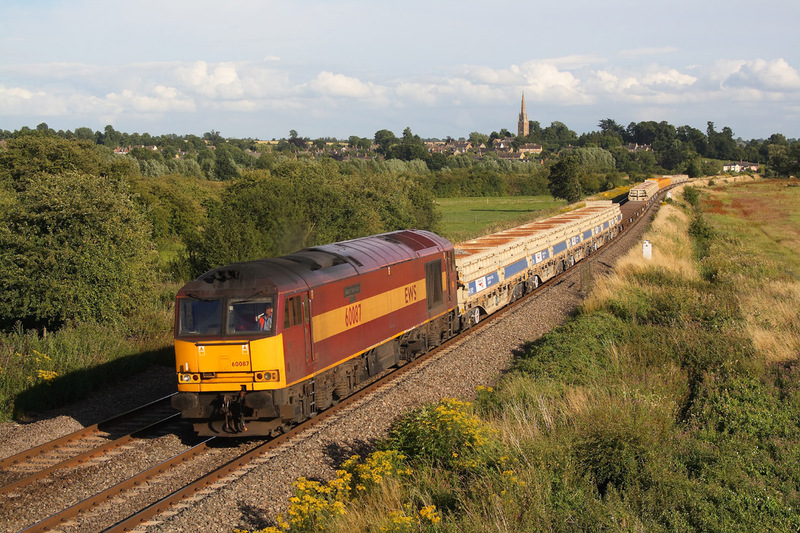 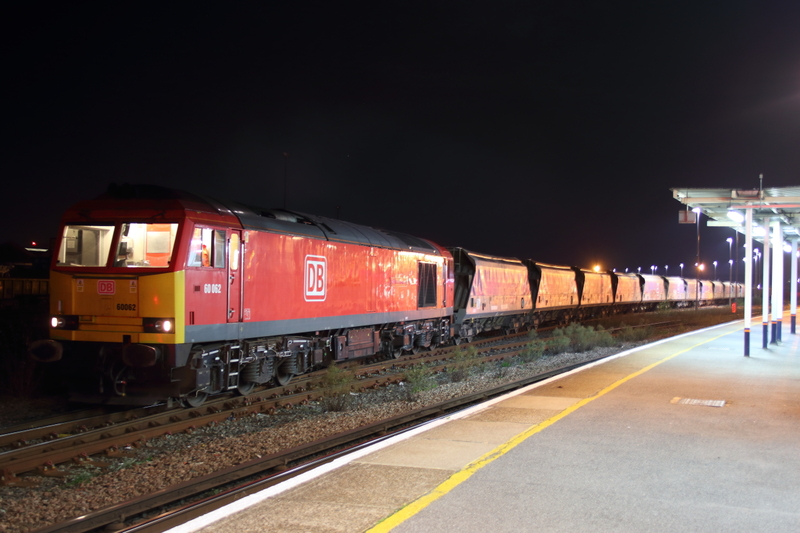 60100"Pride of Acton" 6V70 Didcot(overnight fron Lindsey) to Colnbrook loaded fuel tanks. 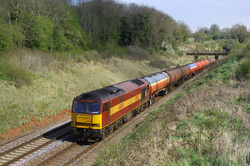 60025"Caledonian Paper" 6B33 Theale to Robeston empty Murco tanks.